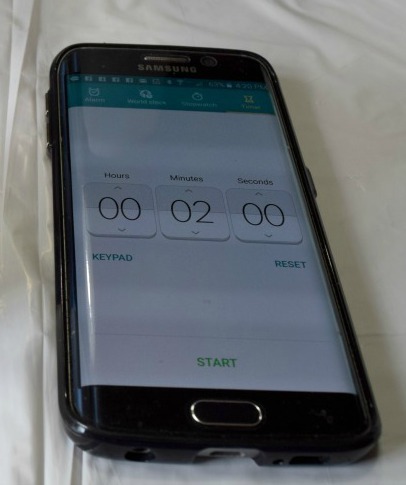 FastCast® sets up in 10 minutes which makes it perfect for so many projects. Since journaling continues to be a hot trend, I thought creating some journal clips would be a great addition to this trend. The best part is, dozens of these can be created in no time at all. Instructions:Spray mold with mold release. 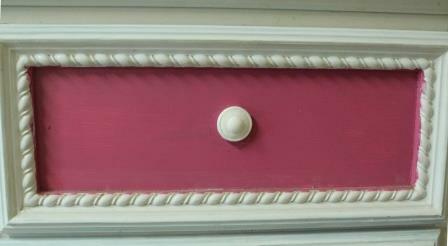 FastCast® pieces dry white, they can be left as is or painted. 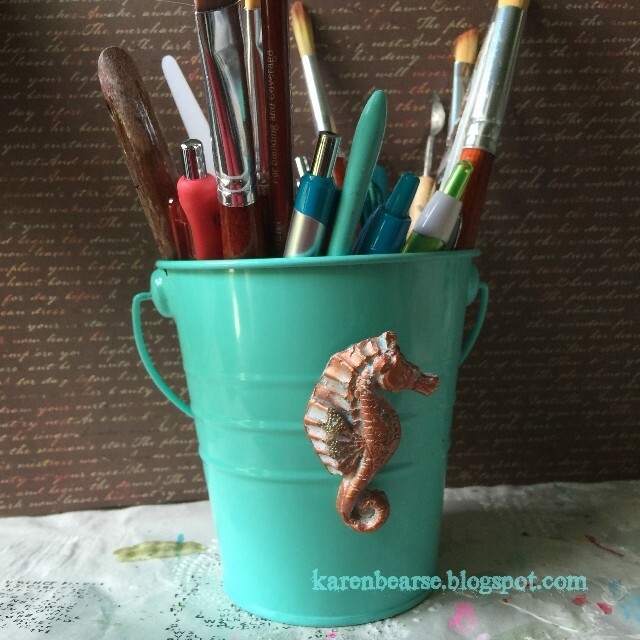 Glue desired pieces onto paper clips, let dry.These can be created in any shape you have a mold for...so you can theme them for your journals. Give it a try! 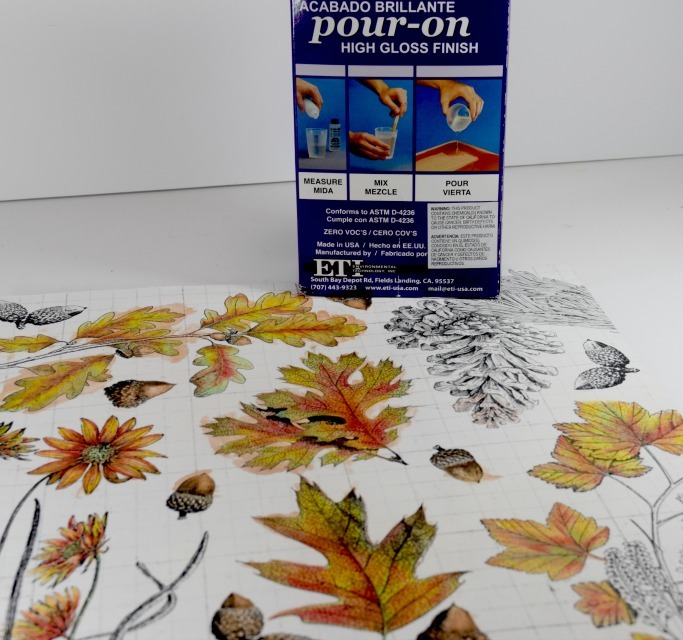 Today we have a multi‐layer home decor project using EnviroTex Lite® Pour On Coating and assorted papers or fabric motifs created by Hillary Stephens. NOTE: If project base is made of wood, stain and then seal the wood with a thin layer of Ultra-Seal™ or paint the surface and let dry. The thin layer will seal the air pockets of the wood and prevent air from releasing bubbles in the thick layers of EnviroTex Lite®. If you choose to use EnviroTex Lite® as the thin sealing layer, apply with a sponge brush. Don't use the propane torch on this thin layer of EnviroTex Lite®. DO use the propane torch on subsequent layers to remove any bubbles. Mount paper or fabric patches to the surface of the table using Ultra-Seal™. 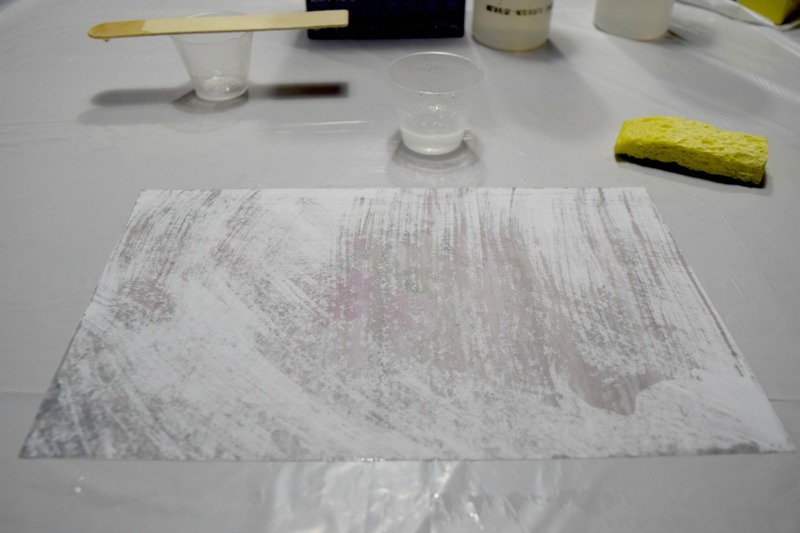 The paper must be smoothed onto the surface and all air bubbles pressed from beneath the paper. Allow to dry. 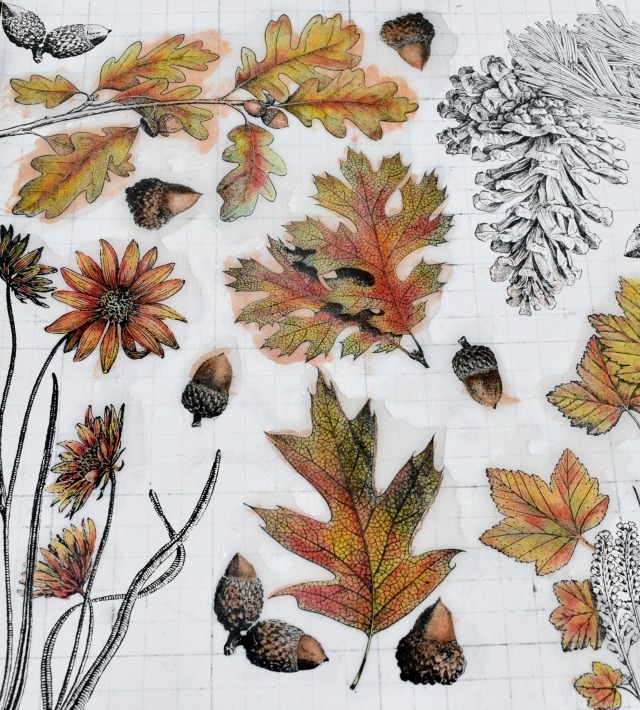 Apply TWO layers of Ultra-Seal™ over the top of paper or fabric, allowing each layer to dry thoroughly. 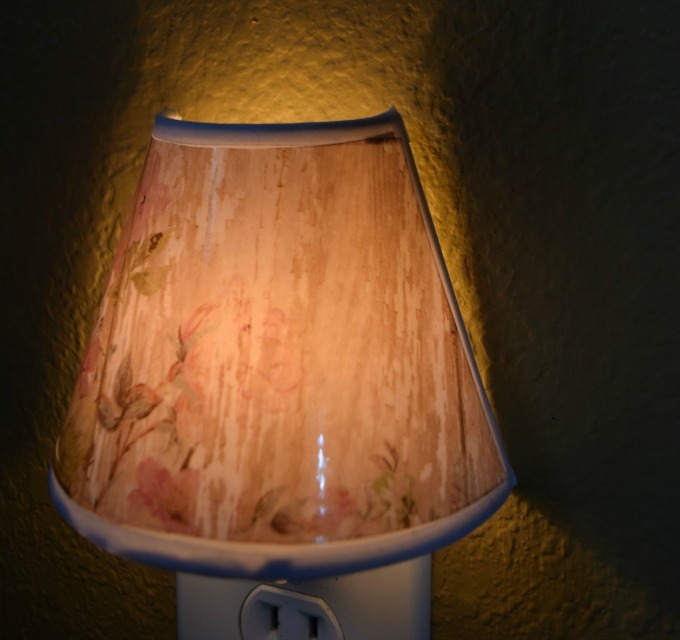 The Ultra-Seal™ creates a protective layer to prevent EnviroTex Lite® from being absorbed and darkening paper. Allow final layer of Ultra-Seal™ to dry overnight. Apply first of two layers of Envirotex Lite; use recommended coverage amounts found on the instruction page. 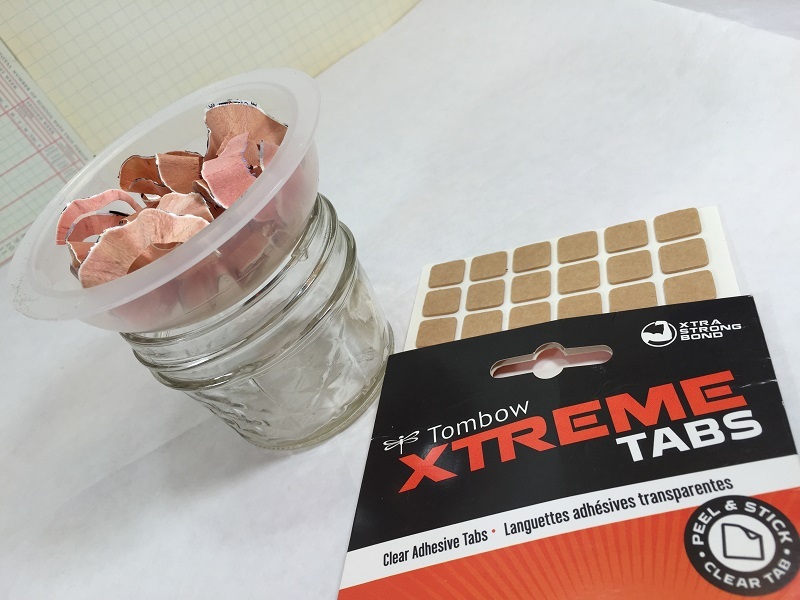 For instance, one half gallon will cover 16 square feet 1/16th to 1/8th inch thick. Many projects will require two layers, allow 8 hours between layers. The coating may be sanded between layers but it's not necessary. If the surface is sanded, wipe with alcohol or acetone and a clean rag to remove dust particles. If the surface is sanded it must be re‐coated. TIPS on BLENDING COATING: Always measure equal parts of resin and hardener. Blend with a wood paint stick for two minutes, mixing vigorously while scraping sides and bottom of the bucket. Then pour coating into a new, clean mixing cup and blend for another minute. Thorough blending is achieved by the above mixing method only! Discard mixing stick. Pour coating onto project immediately. Use propane torch to remove bubbles from coating. You may need to use propane torch several times during a forty-five minute period following each application. Important: read all instructions included in the kit. Hi, Donna here with you today! I'm glad you stopped by. 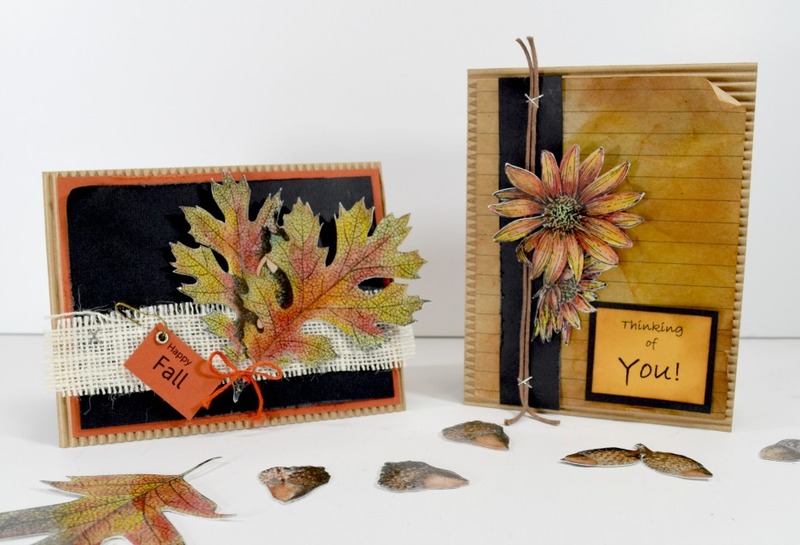 I have used EnviroTex Lite® to make these beautiful embellishments for my cards! 1. Gather all materials and cover work area. 3. Once finished coloring and adding Glimmer Mist, let dry. 4. 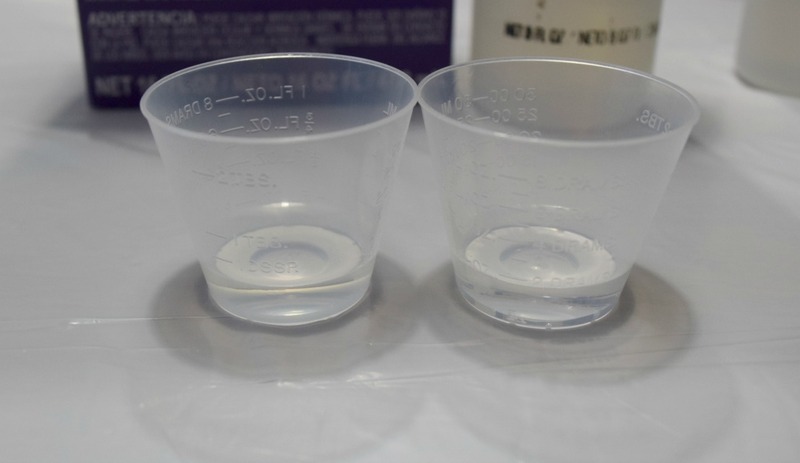 Pour equal parts of Resin and Hardener in separate cups. Pour Resin into Hardener and mix for 2 minutes, scraping sides and bottom. 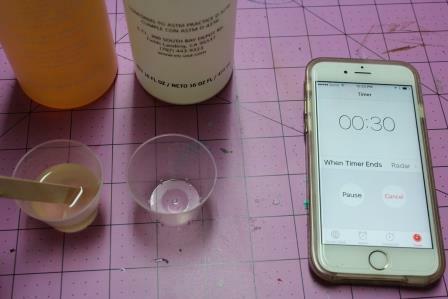 After 2 minutes pour Hardener and Resin into other cup and mix for an additional 1 minute. 5. 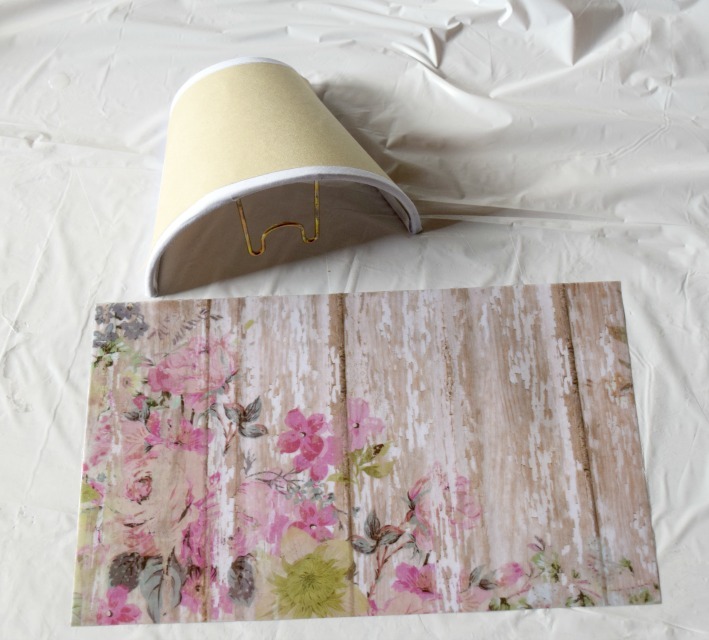 Apply EnviroTex Lite® onto paper using a paintbrush. I applied to all colored areas. If air bubbles occur, use a lighter over the top to pop them. Let dry. I let mine sit for 24 hours. I didn't want any finger prints on my embellishments. 6. Cut out and enjoy your new embellishments! They are GORGEOUS! I used a few of them for gorgeous cards! 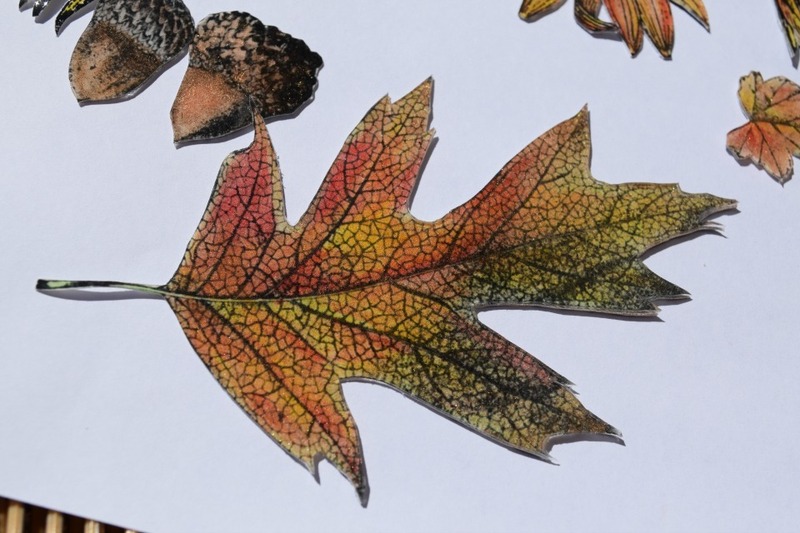 These leaves are so beautiful! I hope you use this for making your own shiny embellishments! These really are beautiful. They would look fabulous on a gift bag, Gift candle on the Thanksgiving table! Let me know what you think, I would love to know! 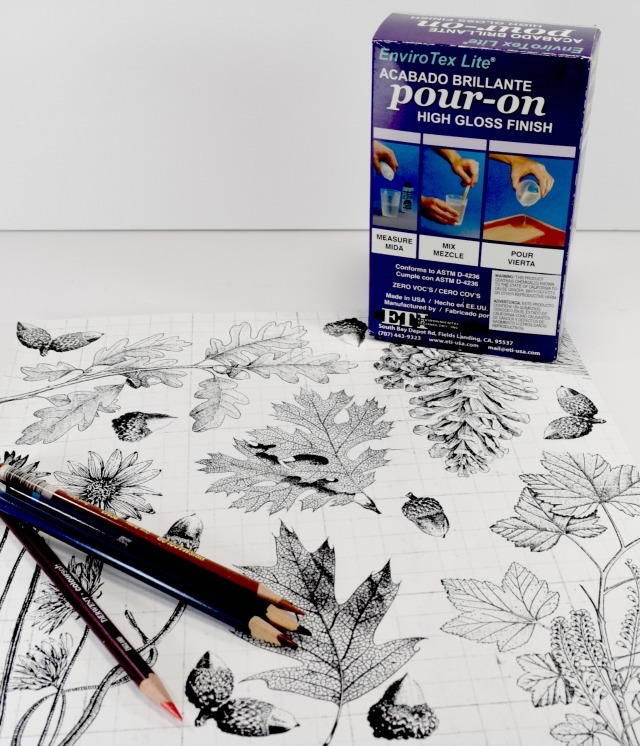 Hi everyone, Beth here on the blog today to share my tutorial for a quick (except for the drying time...LOL!) and easy Pencil Shaving Paper Weight.I recently jumped in the adult coloring trend with a set of Tombow Irojiten Colored Pencils. 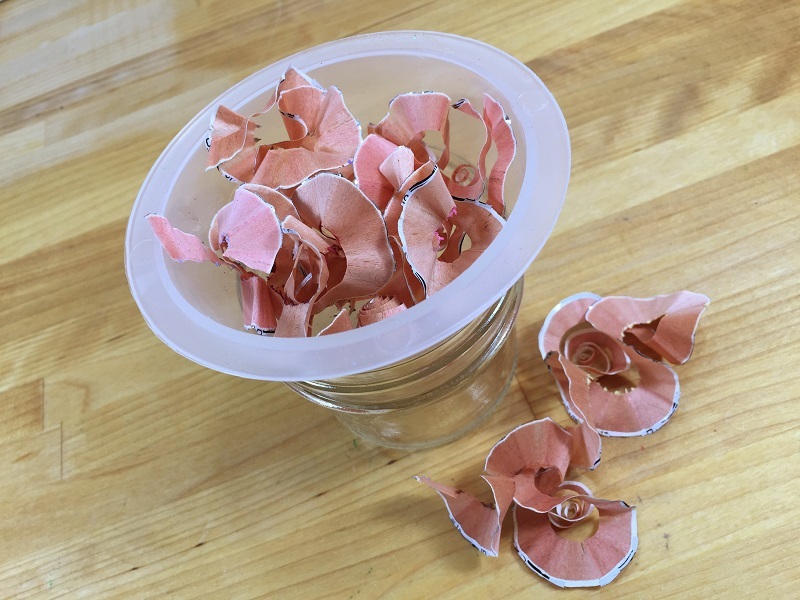 As I was hand sharpening the colored pencils, the shavings were curling and twirling into these beautiful "flowers" and I knew that I had to save them some how. STEP ONE: Secure plastic half sphere mold in a mason jar with Xtreme Tabs. 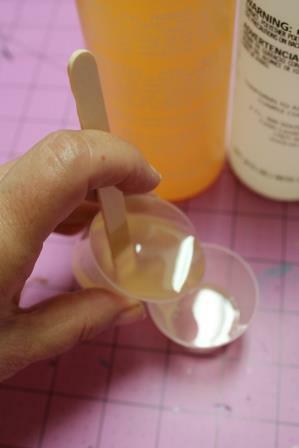 TIP: Fill mold with water, then pour into measuring cup to judge how much resin needs to be mixed. Thoroughly dry inside of mold before the resin is poured. STEP TWO: Arrange pencil shavings in plastic half sphere mold, remembering that the bottom will become the top. 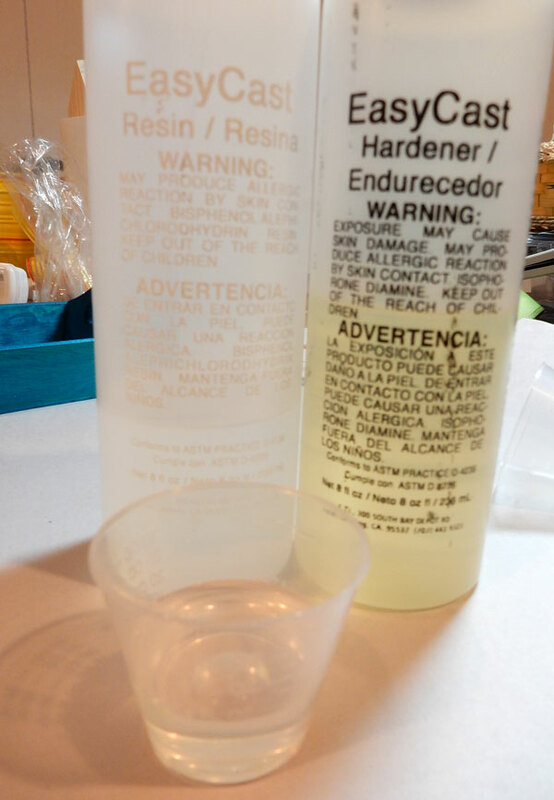 STEP THREE: Mix equal parts of EnviroTex Lite® Resin and Hardener in mixing cup. Mix with wooden stick for 2 minutes. 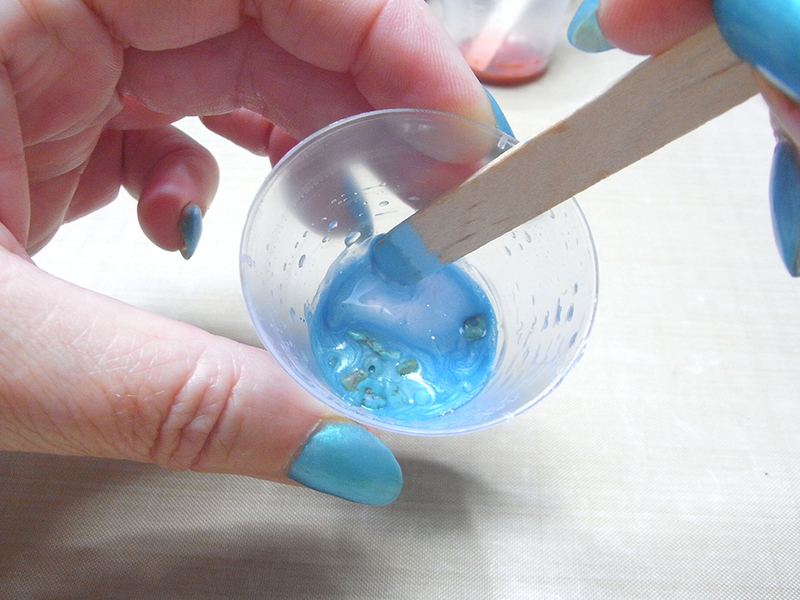 Pour resin in a second mixing cup and mix with wooden stick for another minute. Follow all DIRECTIONS for best results. STEP FIVE: Remove bubbles that rise to the surface with a heat source, like a lighter. Repeating as needed until the resin is set. 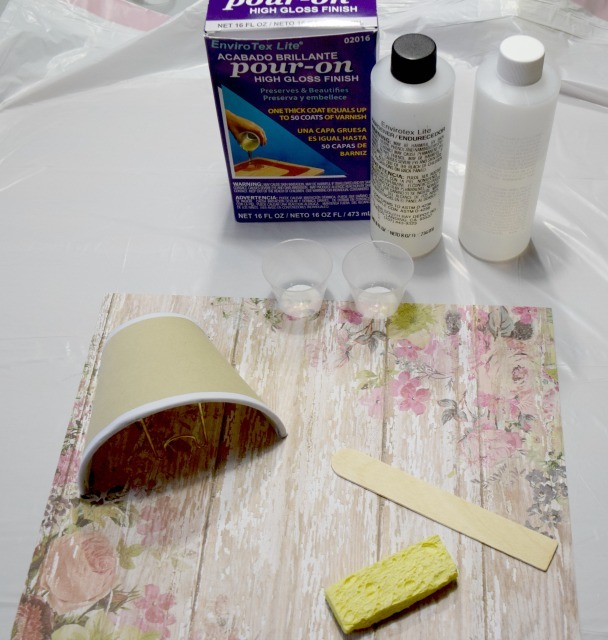 After 24 hours, pop resin out of mold, sand any rough edges with an emory board then place on your desk and ENJOY! 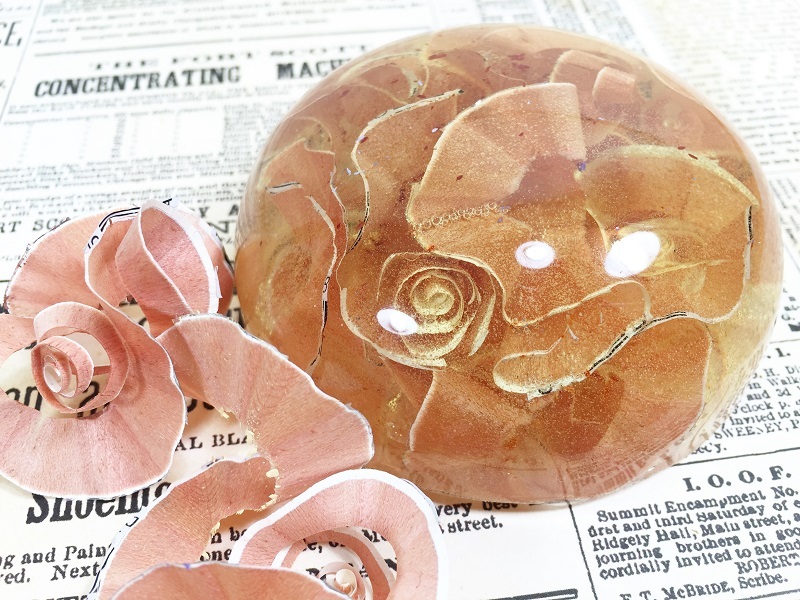 This Pencil Shaving Paper Weight is quite easy to make and would be the perfect gift for a Teacher, a creative Friend or even dear old Dad! What unusual items can you add to resin to create a unique gift? Leave your ideas in the comments below. 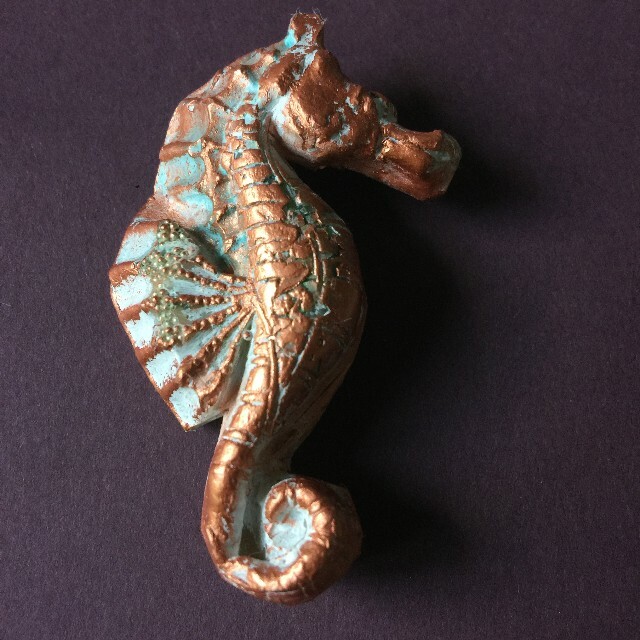 Sea Horse Treasures with EasySculpt® Clay. Karen Bearse here today. 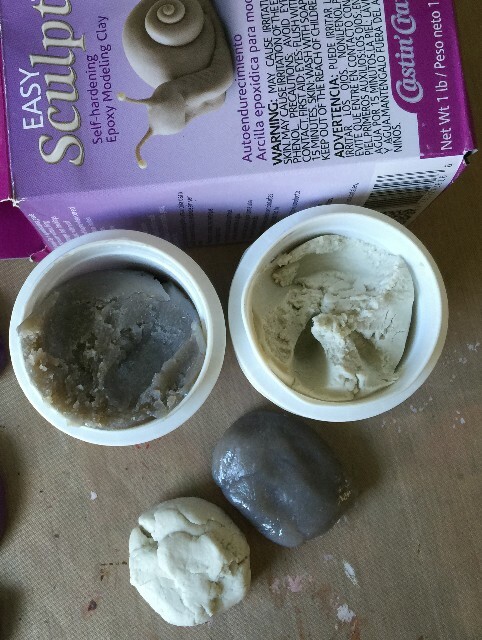 I have been playing with EasySculpt® Epoxy Molding Clay! 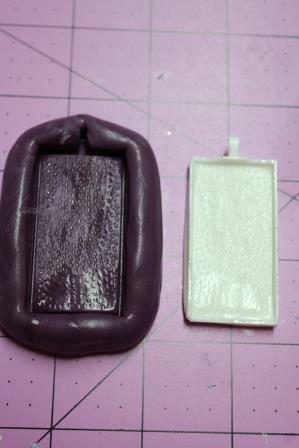 I used a few of the molds I had made previously with Silicone Putty. 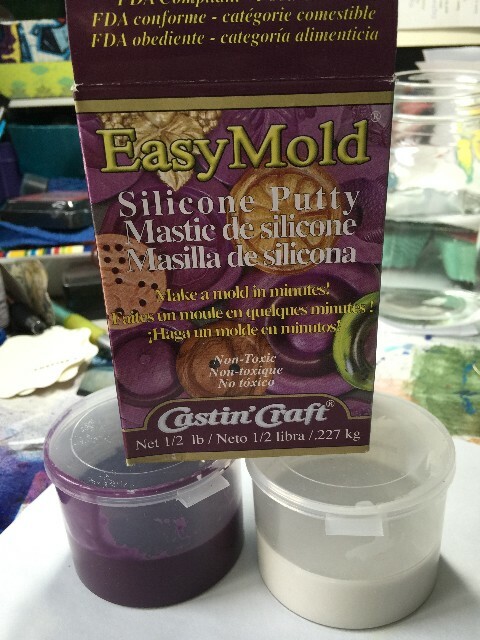 EasyMold™ Silicone Putty Directions:First, start by making the mold. 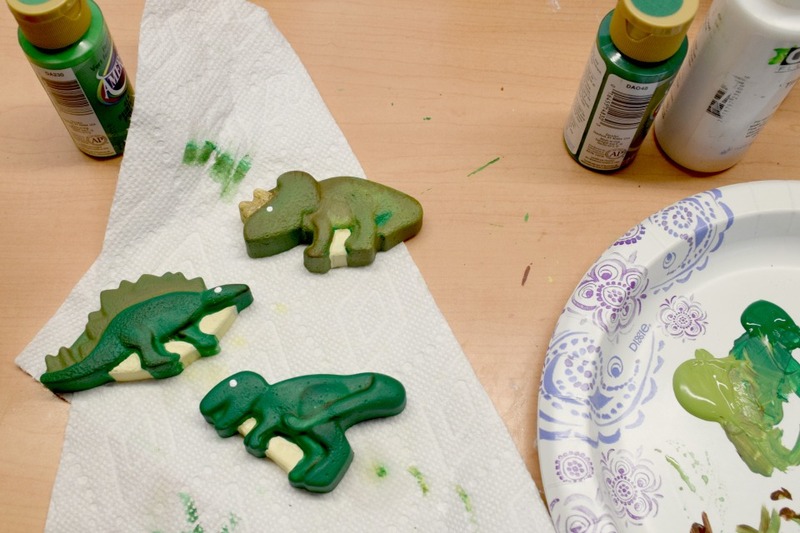 Figure out how much putty you will need to create your mold. Work on 1 mold at a time. Read product directions for more information. 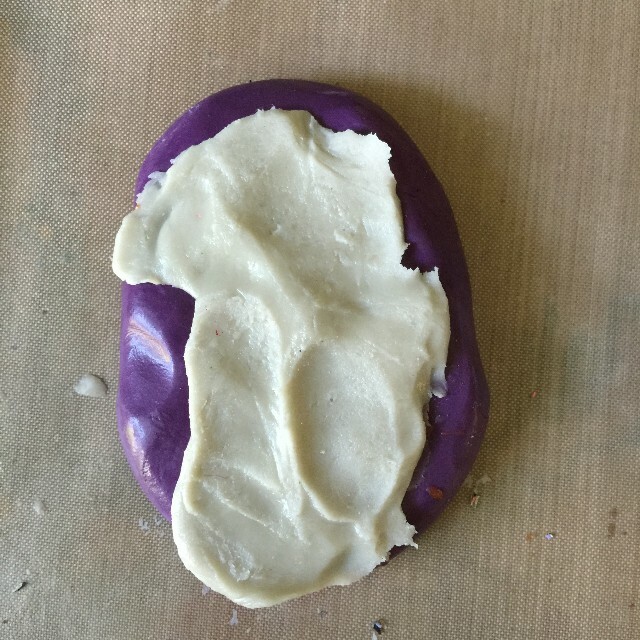 To prep the clay, mix equal parts of A and B. Knead until the clay is a uniform color. The clay will be quite sticky but can be used for molds right away. 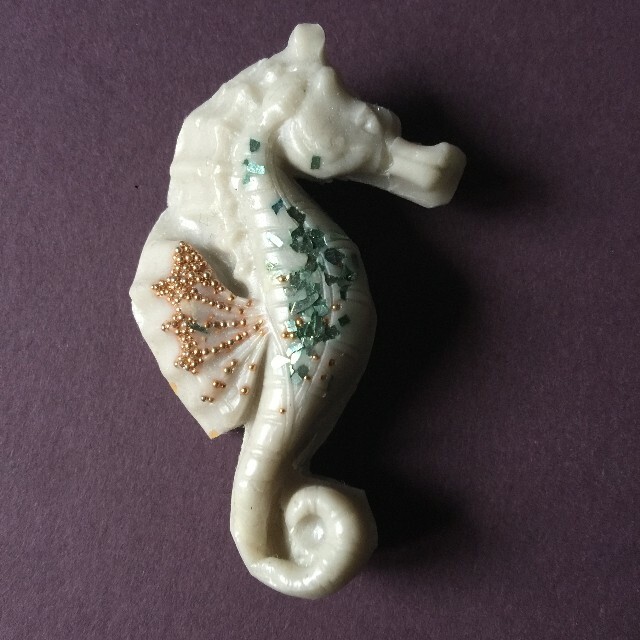 For my seahorse, I put some glitter glass & micro beads in the mold first & then pushed the clay into the mold. I pulled it out of the mold after 4 hours & trimmed the edges. If the clay is too hard to trim simply sand the edges. The clay will be fully set in 24 hours. Now, what do I do with a clay seahorse? Well first I needed some color but I didn't want to cover up the glitter and beads so I put a thin layer of decoupage glue over those areas. Then, any paint that got on this area could be easily wiped off. I covered the clay in gesso which creates a foundation for paint to adhere and will give me a shabby vintage look. Again, staying clear of the beaded areas, and wiping off any gesso that got on them. Once the gesso is dry, I use my finger to add the Metallic Luster. Using fingers or a firm piece of foam helps keep the color from going in the depressions. Now my piece has an old relic look. I did end up covering the glass glitter. So in hind sight, next time I would add a lot more in a more condensed way so it would be easier to protect. This is so cool! I love how my piece looks like I could have found it in an ancient archeological dig except I just made it!!! This technique would be great to use with shells, cherubs, mermaids.... the possibilities are endless. I decided to make a quick home decor piece. It may end up in my bathroom as a toothbrush holder but for now, it is a pencil holder. I had bought this $3 tin from Target in the dollar bin and it was the perfect home for my treasure. Sometimes gluing these pieces can be difficult but I found a trick. I started by placing a large Zot by Thermoweb or glue dot in the middle of the seahorse. Before I placed it on the tin I covered the area around the Zot with a nice coat of Glossy Accents (a strong wet glue). After placing the seahorse clean off excess glue with a wet paint brush. 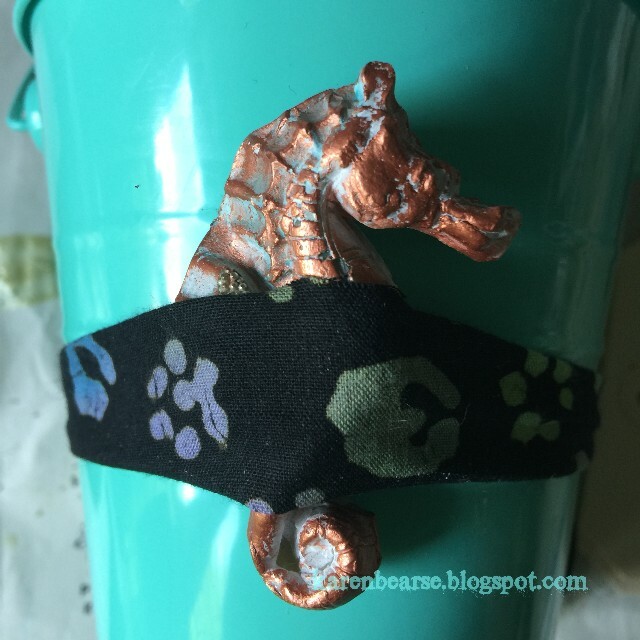 Tie a piece of ribbon or fabric around the seahorse and the cup to hold it together strongly while the glue sets. Here is a finished project using my new vintage treasure! I am excited to make more pieces and adhere them to frames, mirrors, journal covers or art journal pages. 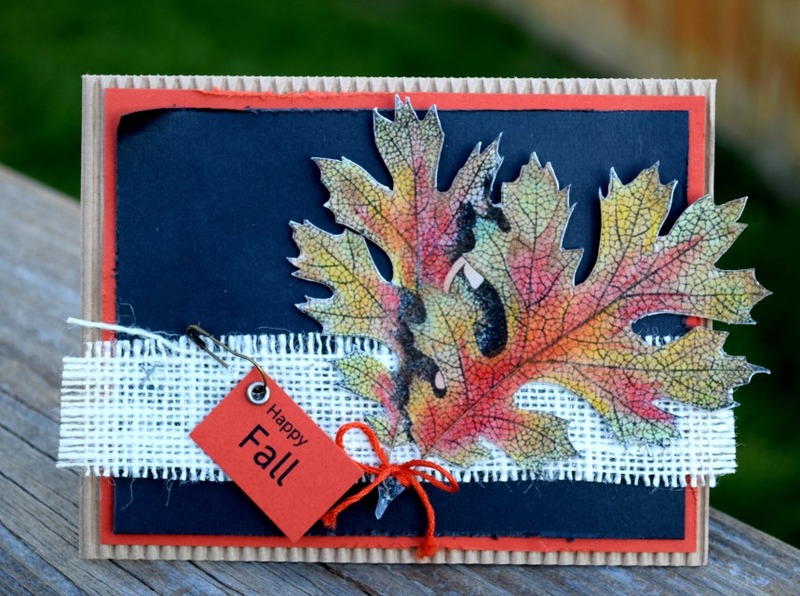 Good morning, Donna Budzynski here with you today and I would like to share with you a really fun project using FastCast™! This is a new product and you are going to LOVE it!!! 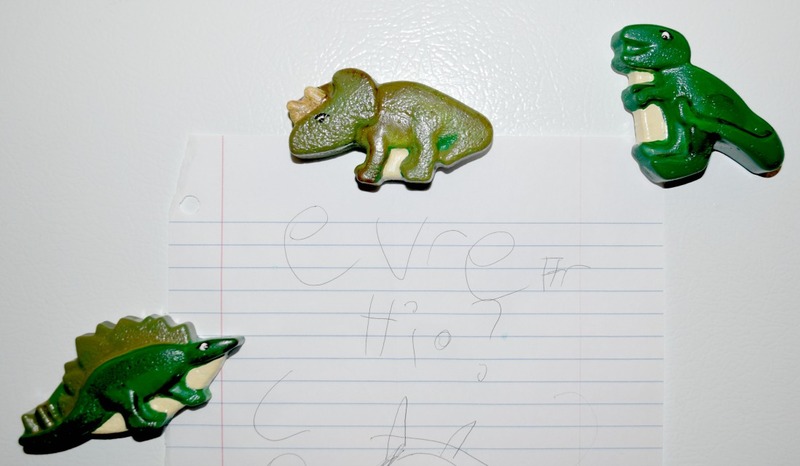 With school starting, you know those kids will have plenty of pictures to hang on the refrigerator and I am going to show you a fun way to hang them! 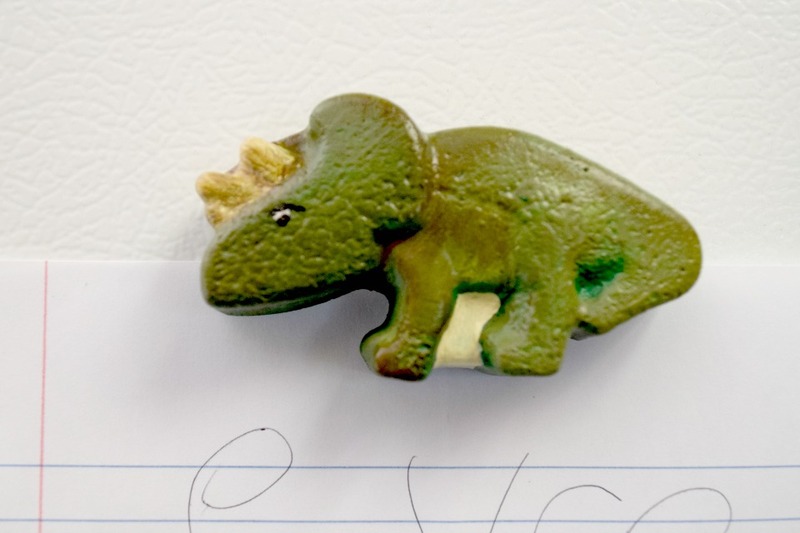 We are going to make some dinosaur magnets! 2. Pour equal amounts of part A and part B of FastCast™. 5. Wait 10 minutes. Yes, it is that fast! Amazing! Take out of the mold. Lightly sand edges of the backside. 8. Hang them up and enjoy! The details were picked up like magic from the mold! Another option for this is....for children birthday parties, you could make one or two for each child to paint and bring home for there own magnets. Prize and a project all rolled into one! Tell me what you think, I would love to know! 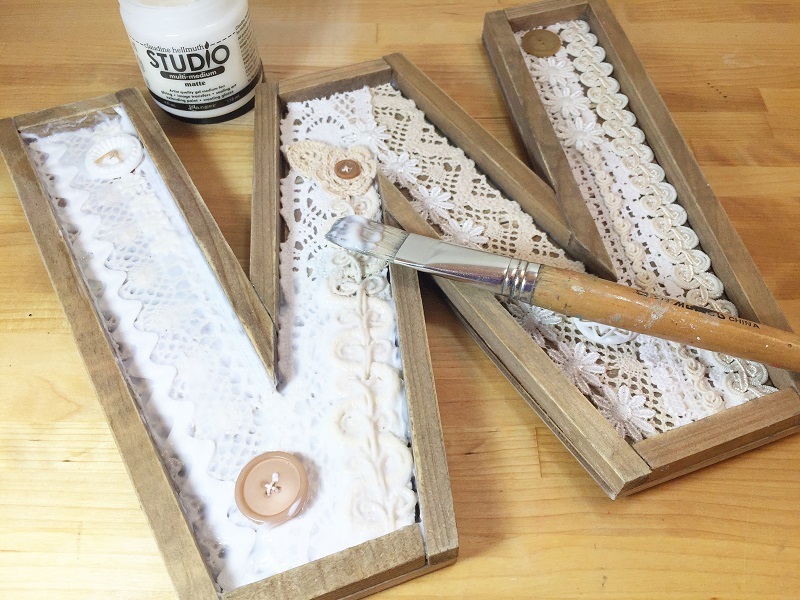 Hello Resin Lovers, Beth here on the blog today sharing another great project, a Lace Monogram! 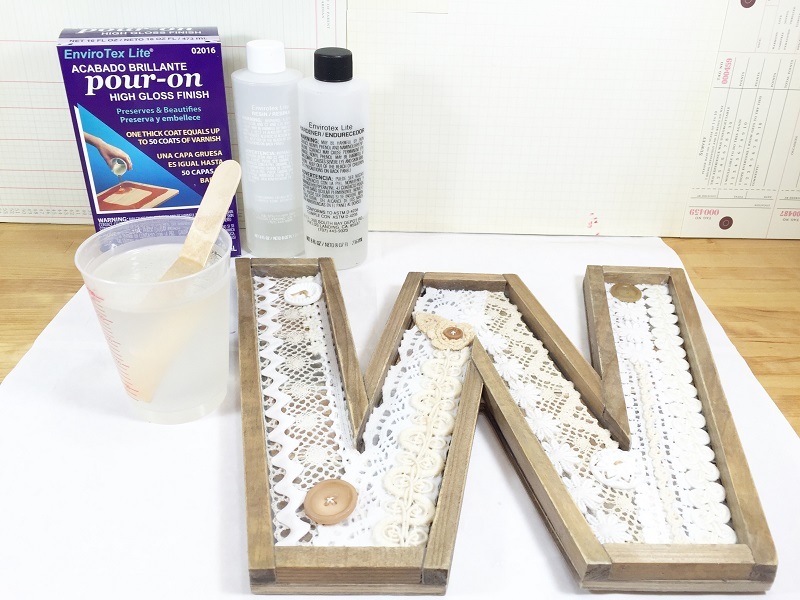 I always have an eye out for objects that I can add dimensional items and resin to, so on a recent trip to the craft store I had a major score with this monogram W! Instructions:STEP ONE: I always seal the interior and exterior edges of found objects with glue before filling with resin. 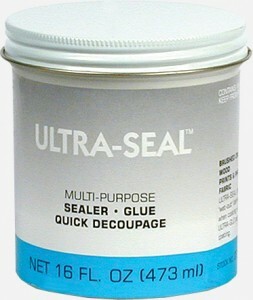 This will seal any small cracks that resin could seep out of and ruin your project. STEP TWO: I hoard collect interesting lace and trims, so in an effort to use up all those bits and pieces that I just can't throw away, I used them to fill up the inside of my monogram. 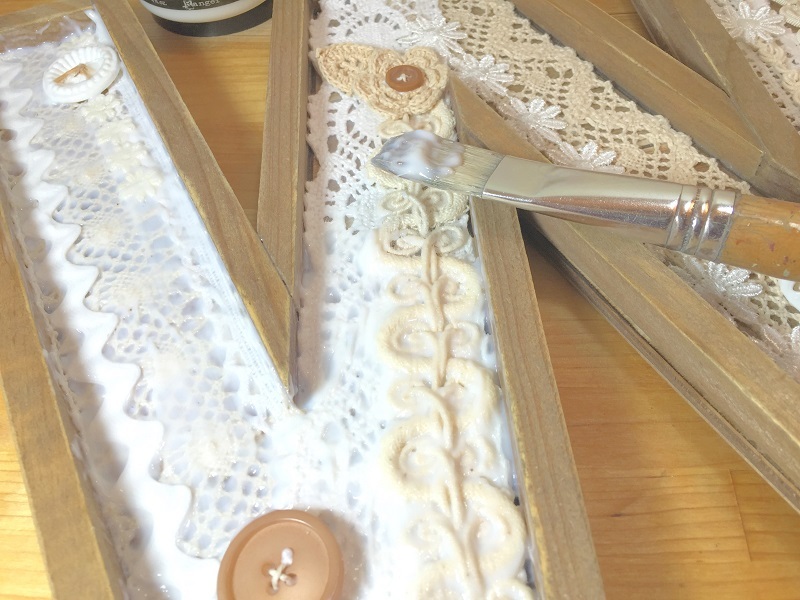 Secure the lace and buttons to the base with a matte medium sealer. 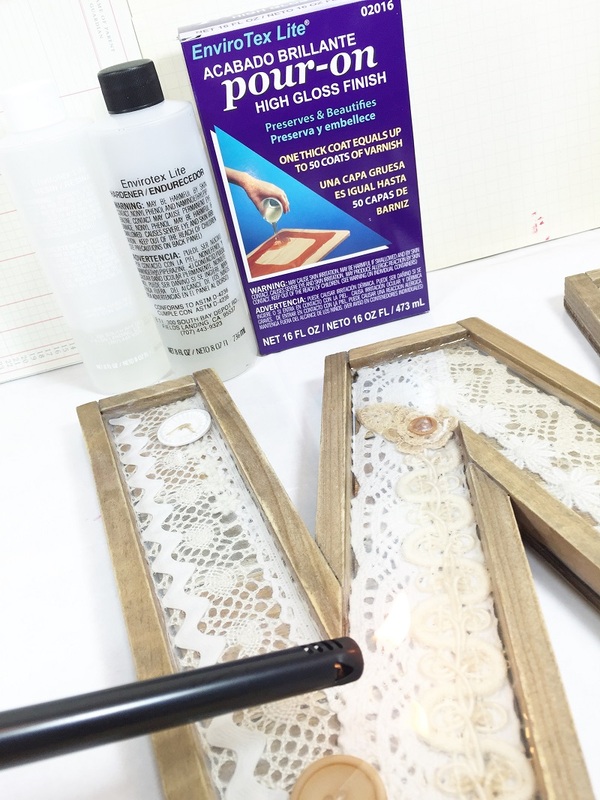 STEP THREE: Then apply several heavy coats of matte medium to the top of the lace and the buttons to seal them in place. 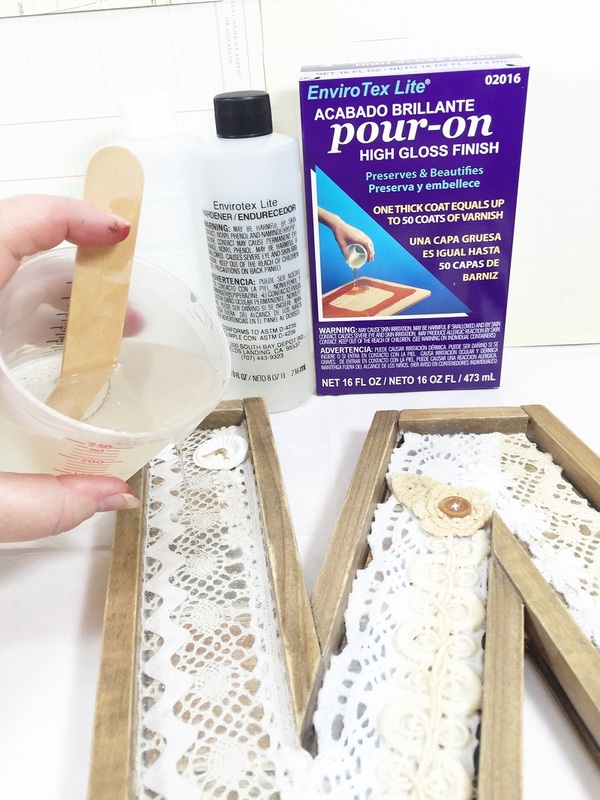 This will prevent the resin from penetrating the lace and changing the color. 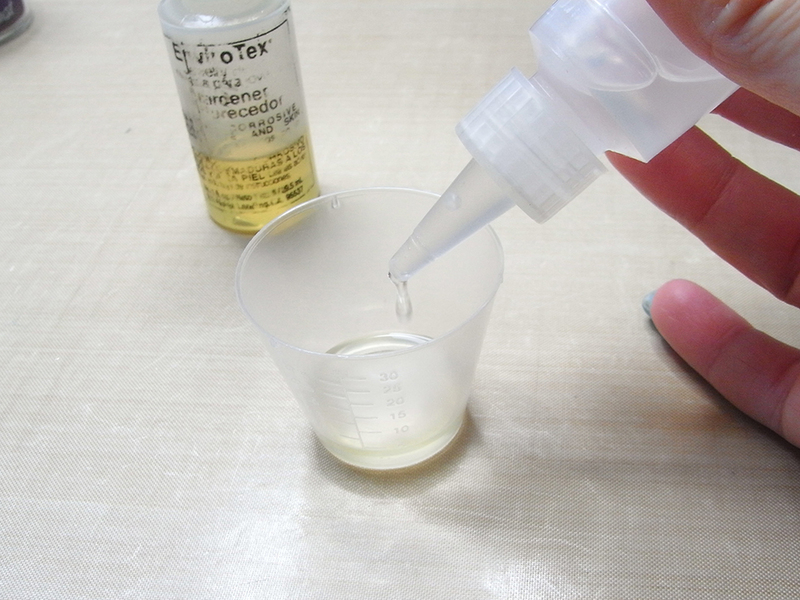 STEP FOUR: Mix equal parts of EnviroTex Lite® Resin and Hardener in mixing cup. Stir with a wooden craft stick for 2 minutes. 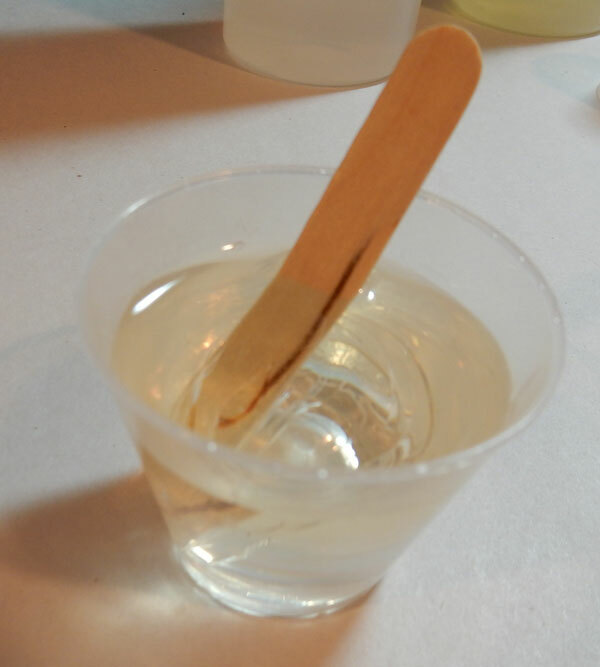 Pour the resin into a second mixing cup and stir with a wooden craft stick for another minute. Follow all the manufacturer's DIRECTIONS for best results. STEP FIVE: Find a level spot that is out of the way and line surface with waxed paper or freezer paper. 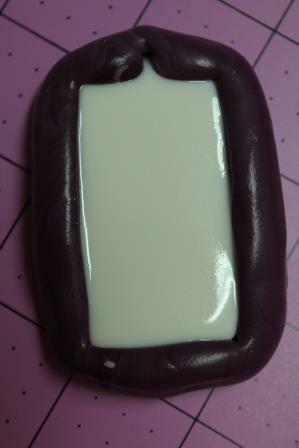 Carefully pour resin into the mold. I always stop just shy of the top edge of my project to give the resin room to self-level and settle. STEP SIX: Remove any bubbles that rise to the surface with a heat source, like a lighter. Repeating as needed until the resin is set. Here is a detailed shot of the layers of lace and buttons! 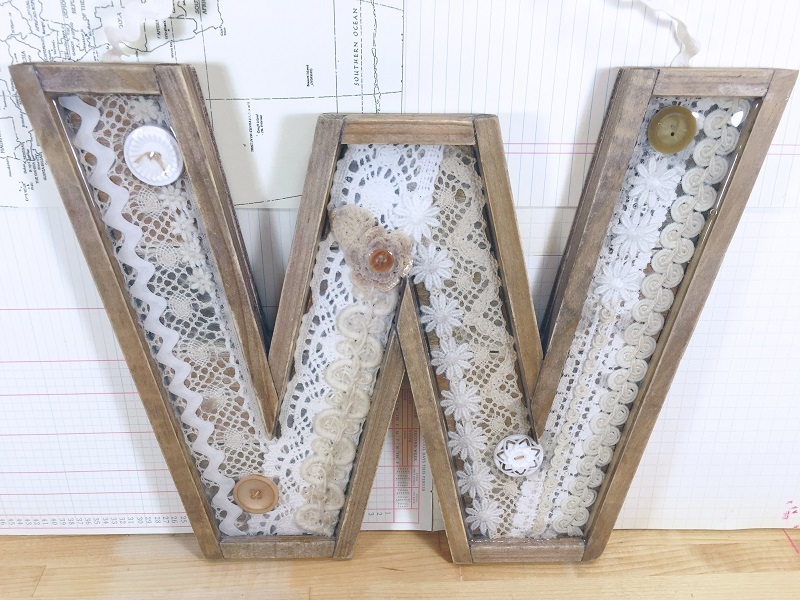 I love how this Lace Monogram turned out and can't wait to hang it on my front door! 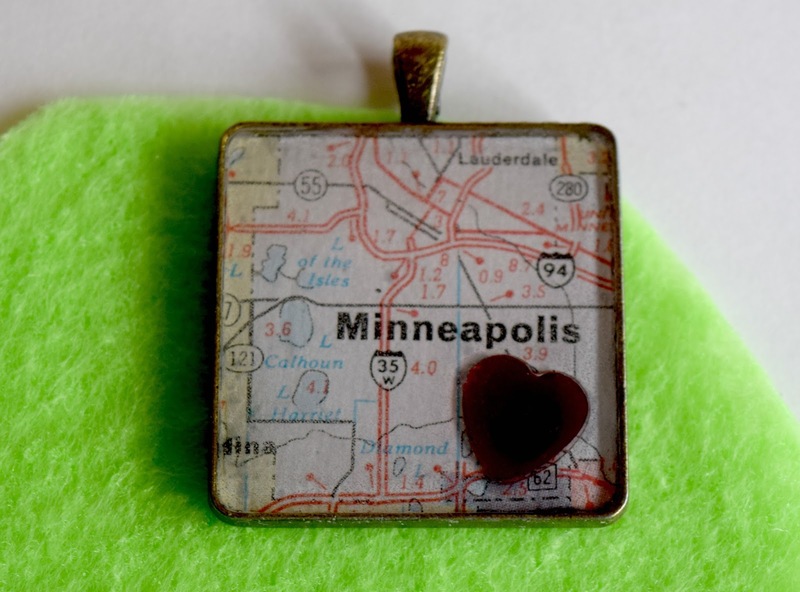 Take a look around the next time you are the craft store for items that can be altered with resin! Share your resin projects on the Resin Crafts FB Page. I posted a few weeks ago a piece of art created and then coated in Envirotex Lite®. Today I am sharing her sister with a few changes! Find a piece to up-cycle. 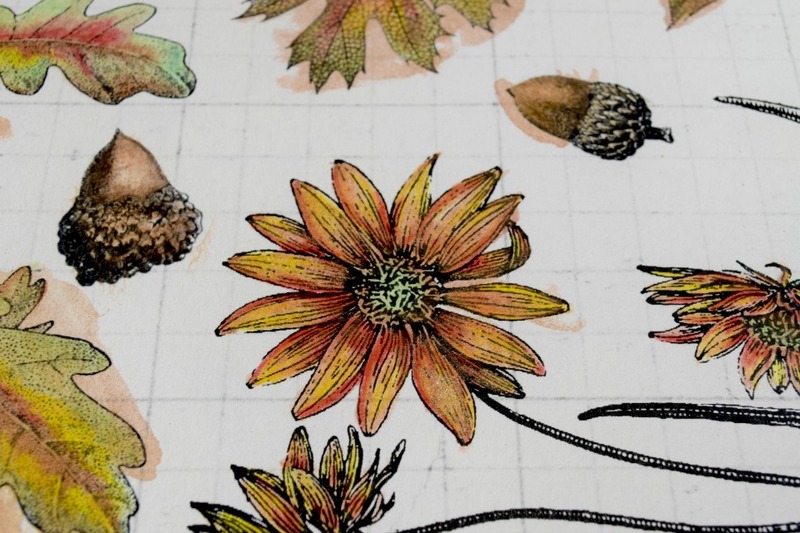 Make a bunch of mono prints using a gelatin plate of your choice. Tear them into strips. Starting at the top of the canvas, layer the strips! I used the Tombow glue to attach all paper strips. Continue to work down the canvas. I was going for a sunset look so I layered accordingly. I flipped the canvas upside down and started applying greens for the landscape. After the canvas was covered I allowed it to dry. I then painted a rough tree outline with branches flowing more than stiff.The texture was added using the stencil paste and a palette knife. Once dry I did the dry brush of earthy colors over the paste and let dry. I wanted a little shimmer so I used Iridescents. 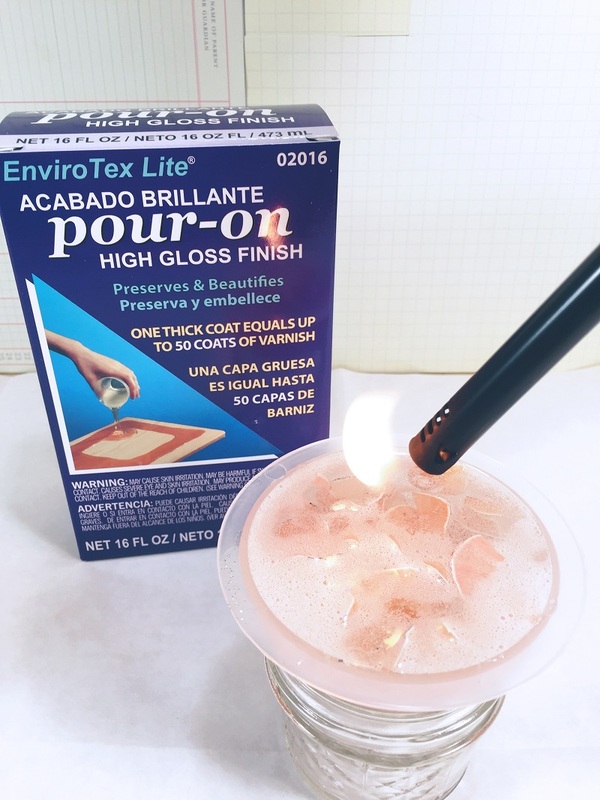 THE MAGIC HAPPENS - Enter EnviroTex Lite® Pour On Resin!!! 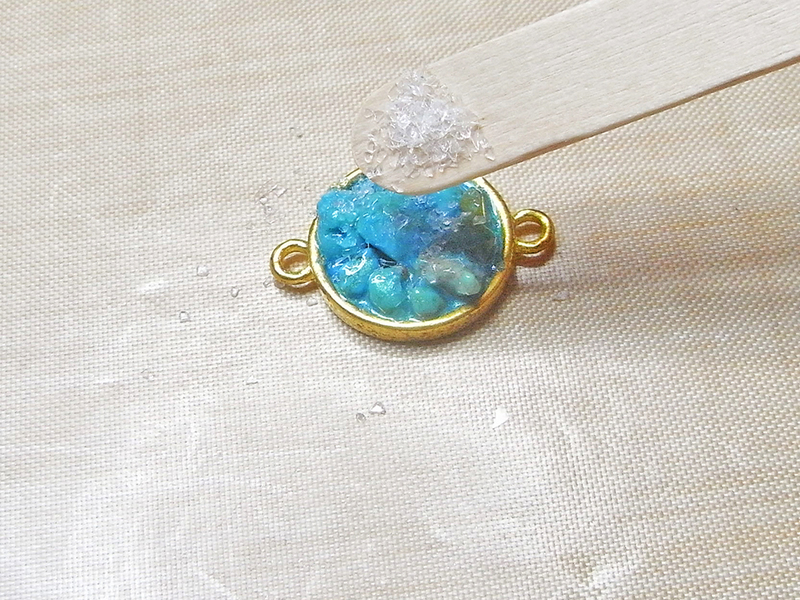 I mixed the resin in small batches to insure complete mixing for the best result! Measure out equal amounts of the EnviroTex Lite® resin and hardener. Mix together and stir for 2 minutes. Pour into a second cup and stir for 1 minute. I do this in the garage with a tarp covering anything I don't want resin to get dripped on and leave a permanent spot. I prop the art on some cups so the art does not stick to the table. Once dry this is ready to hang in it's new home! This one goes to Cline Dental in Springfield, MO!Not yet on the wall but in the room! 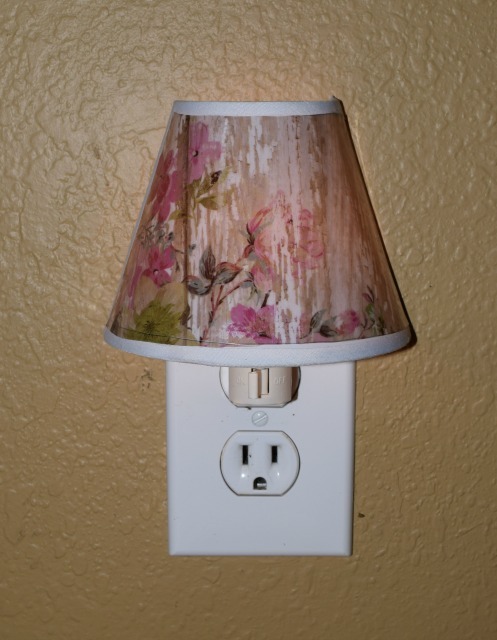 Hope you enjoyed the second installment of Wall Art with EviroTex Lite® Resin! Good morning everyone. 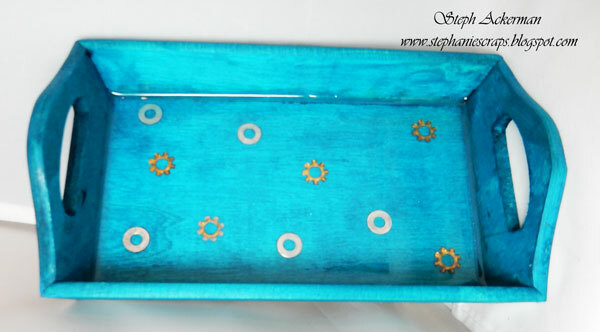 Steph Ackerman here today and I want to share how I created this tray for my husband. He has no spot for his left-over coins so I thought I'd create a tray just for him. 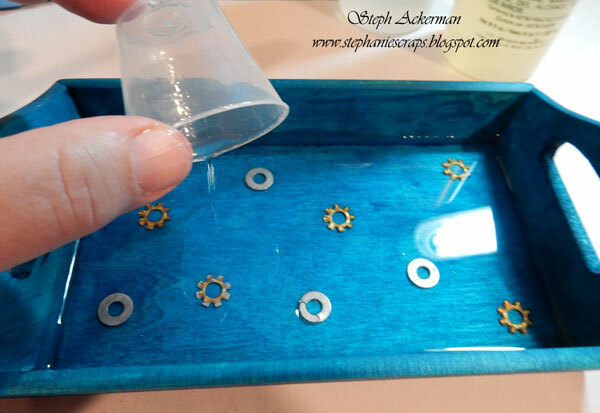 I wanted to include some gears and washers that I found (to give it a more masculine feel), so I used EasyCast® Clear Casting Epoxy to seal them into the tray. Pour into a new mixing cup and stir for another minute. 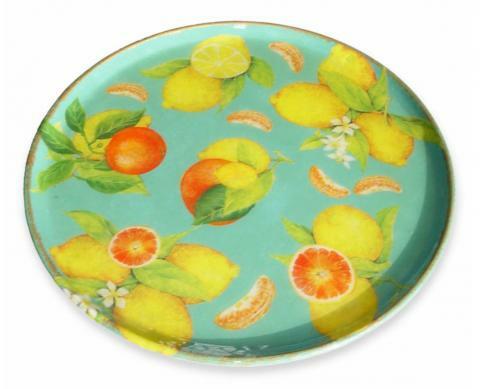 Prepare a wood tray by painting it 2 - 3 times it with FolkArt Ultra Dye in Turquoise, allowing to dry between each layer. 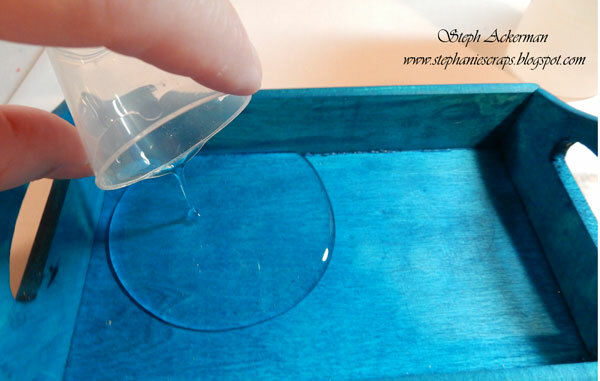 Once the final layer has completely dried, pour the resin mixture into the tray. Tilt the tray to coat the entire tray. Check for bubbles and pop any you might find. Place assorted gears and washers into the resin, being sure to pop any bubbles for a smooth finish. Allow to cure overnight. This will ensure that the gears and washers are embedded in the resin before moving to the next step. Mix another batch of resin as described above and pour into the tray. Again, tilt the tray so the resin covers the entire tray. Pop any bubbles you might see. Since the gears and washers have been allowed to sit overnight, the resin has hardened around them and they do not move when you tilt the tray adding the next layer of resin. What do you think? This is a fun project that would be perfect for anyone on your gift list this year. 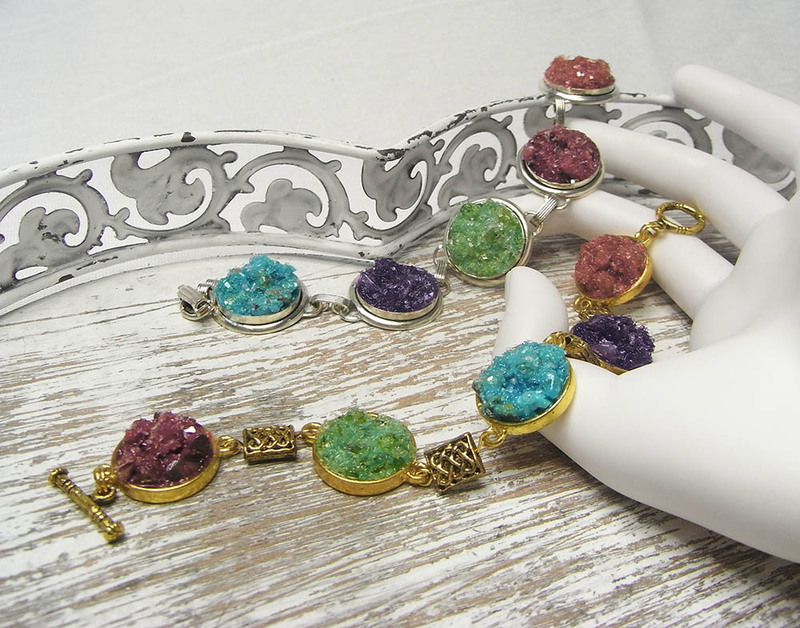 Learn how to create convincing faux druzys with resin and turn them into a bracelet of glittering color to give your Fall outfits an earthy feel. 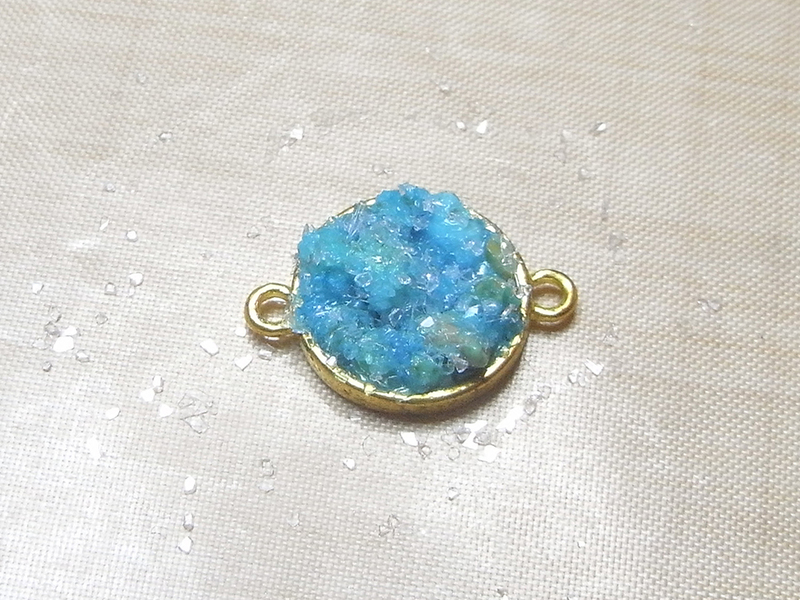 Note: Photos and instructions show how to make the turquoise druzy in the gold bezel. If working with Nunn Design Patera bracelet, attach a piece of foam mounting to the back of each bezel to keep it flat whilst you are working. 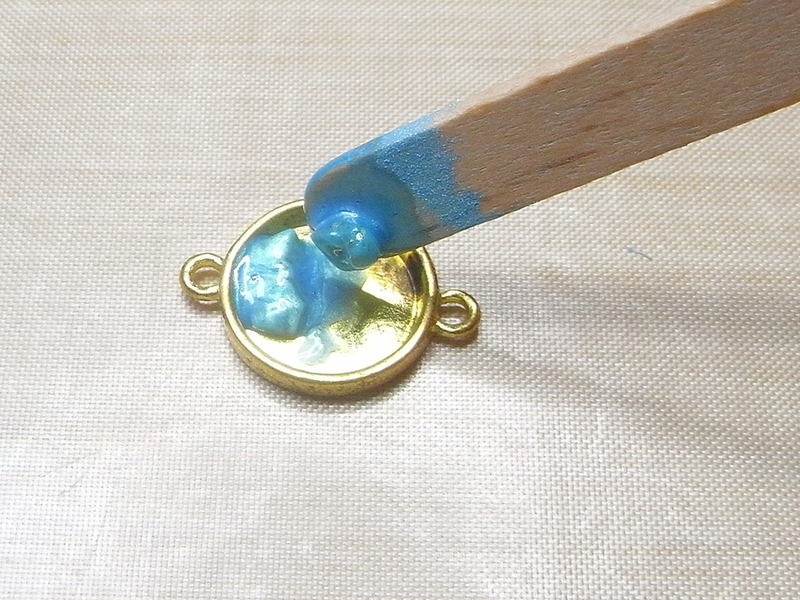 One teaspoon (5ml) of mixed resin is enough to make both the gold and silver bracelets. 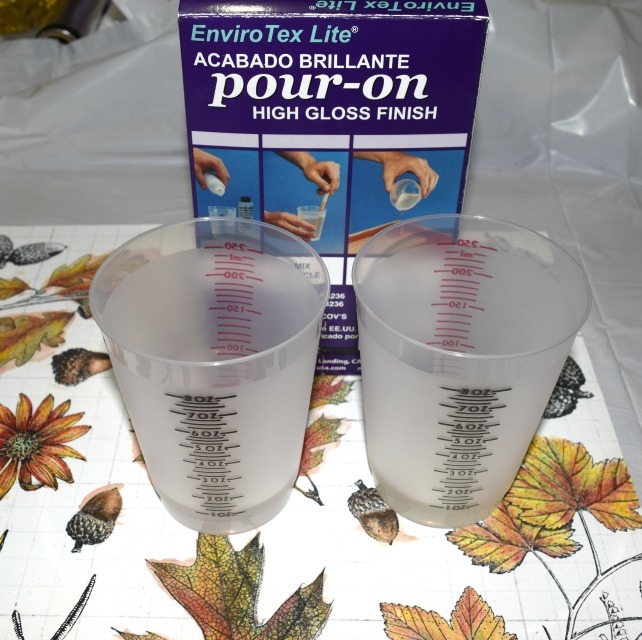 Pour ½ teaspoon (2.5ml) of each part of the Envirotex Jewelry Resin into a measuring cup and mix according to the package instructions. 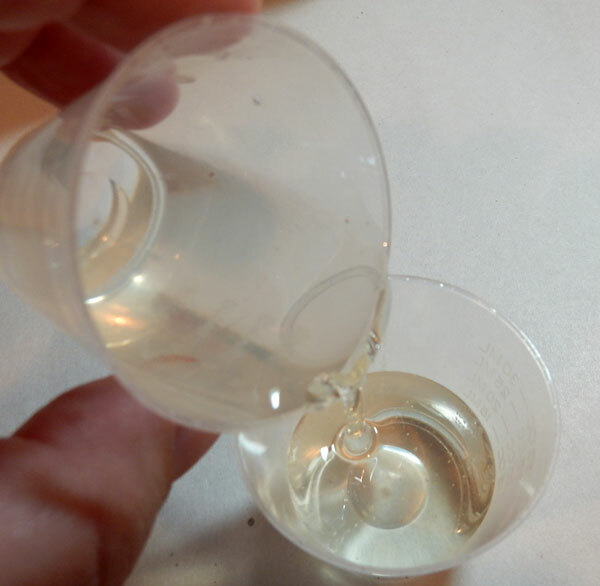 Divide the mixed resin between 5 cups. 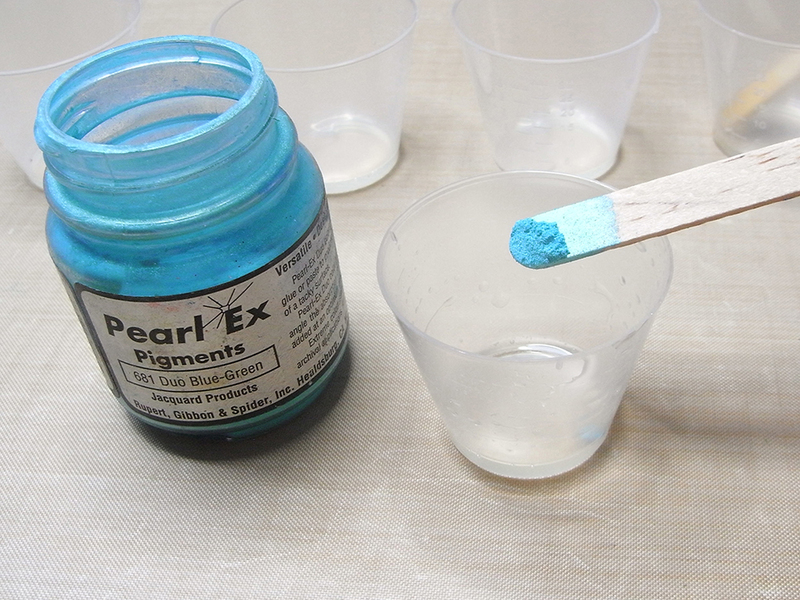 Use a wooden stir stick to add a different color of Pearl Ex to each cup. 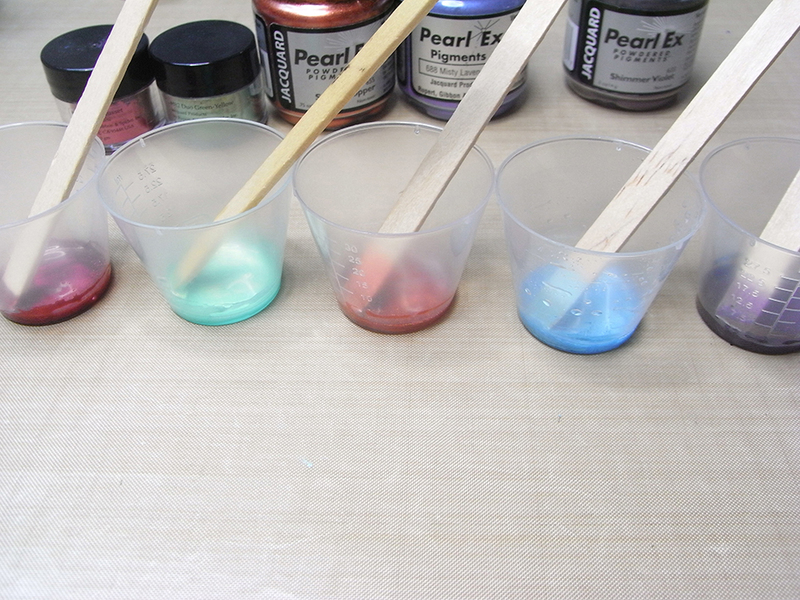 Stir each one until the Pearl Ex powder is completely mixed into the resin. 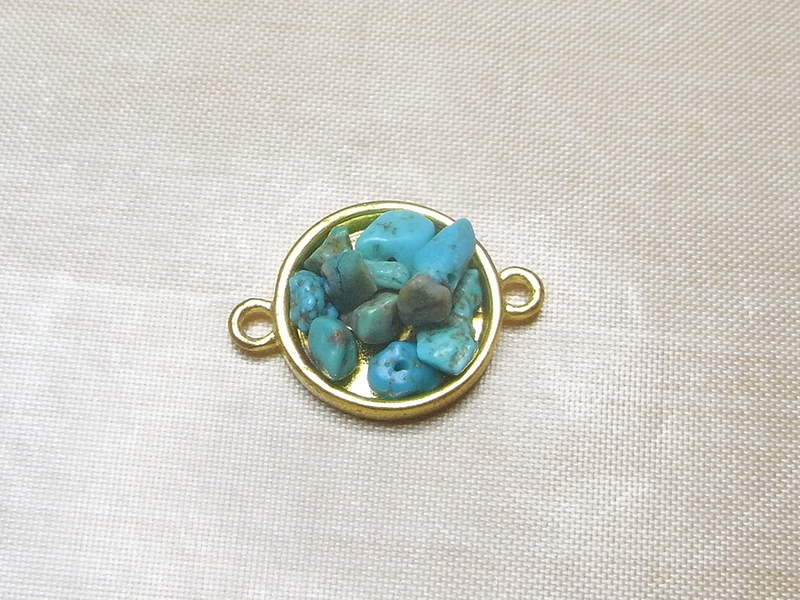 Using a different gemstone in each bezel, fill each one with enough chips to cover the bottom. 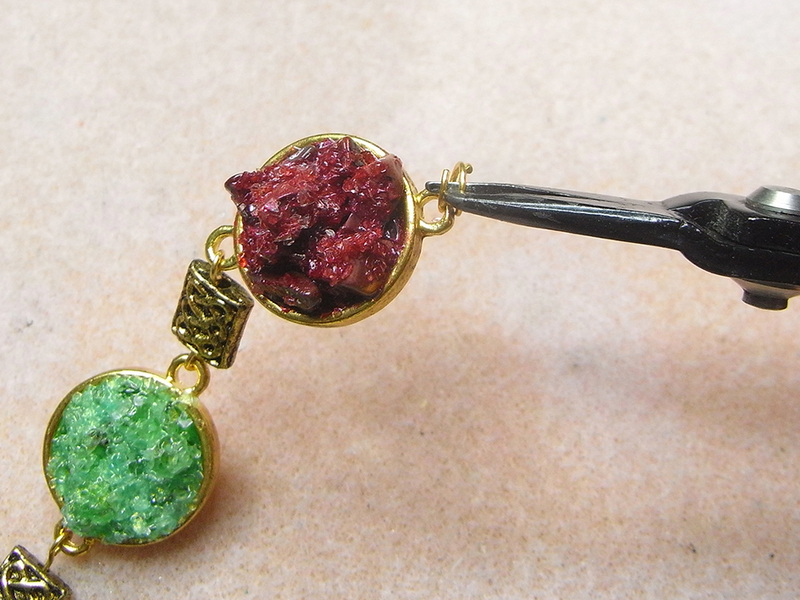 Tip the gemstone chips into the cup of corresponding colored resin.Mix them into the resin to coat them completely. 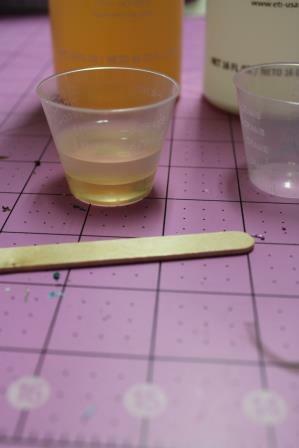 Drag the bead chips up the side of the cup, allowing the resin to drain back into the bottom of the cup. 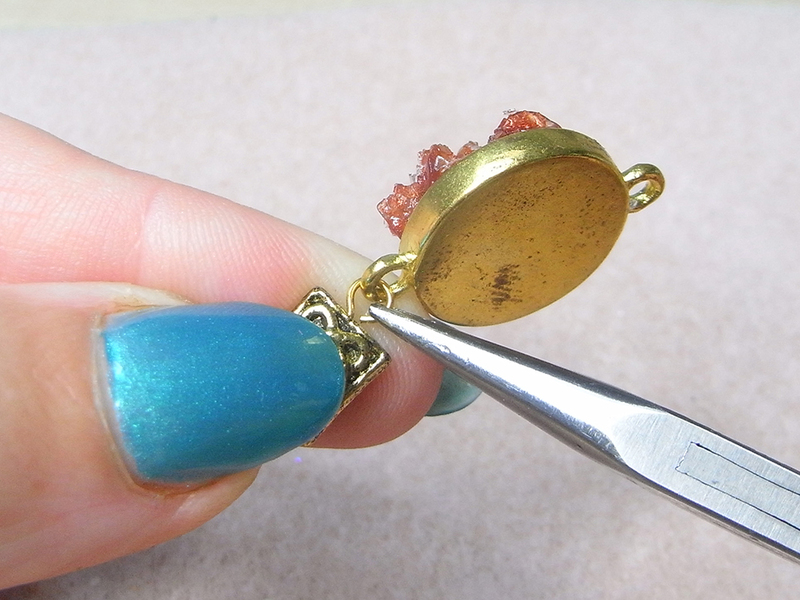 Use the stir stick to spoon the chips into the bezel, one at a time, with the smallest amount of resin possible. This will help the chips keep their jagged shapes and give a more realistic look to the finished druzys. Arrange them so that they fully cover the bottom of the bezel. If there are any gaps, cover the gap with a small amount of resin. Using a clean stir stick, scoop the Diamond Dust out of the jar and sprinkle over the bead chips generously to create the druzy sparkle effect. 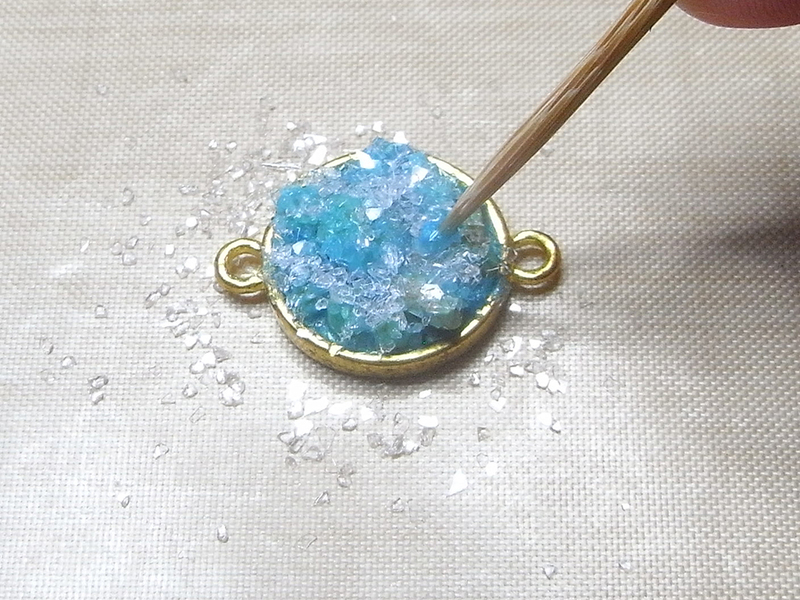 Use a toothpick to press the Diamond Dust into the resin. Set the bezels aside to cure for 12 hours. 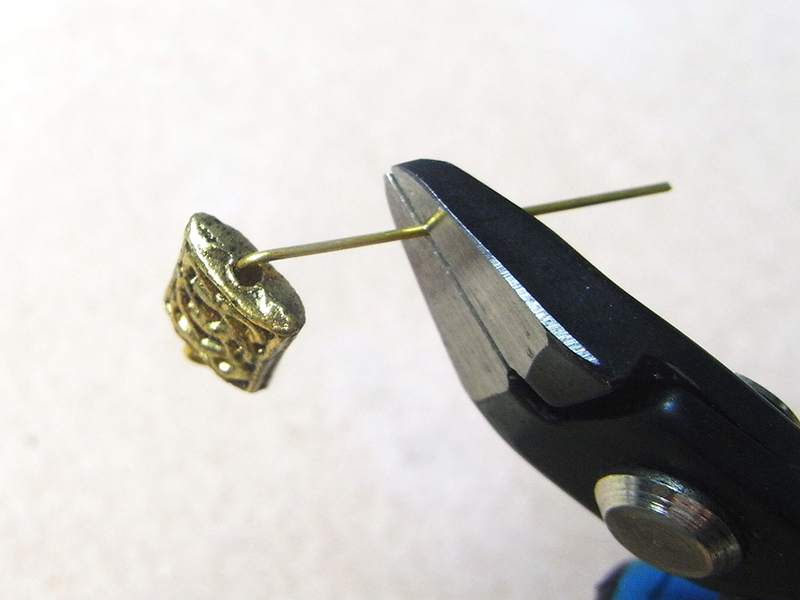 String the spacer beads on the eye pins. Bend them at a 90° angle to the spacer bead.Trim the eye pins to 7/16”. Turn a simple loop on each one. These need to be large enough to accommodate the bezel loops. Lay the faux druzys out in your preferred order and place a spacer component in between each pair. 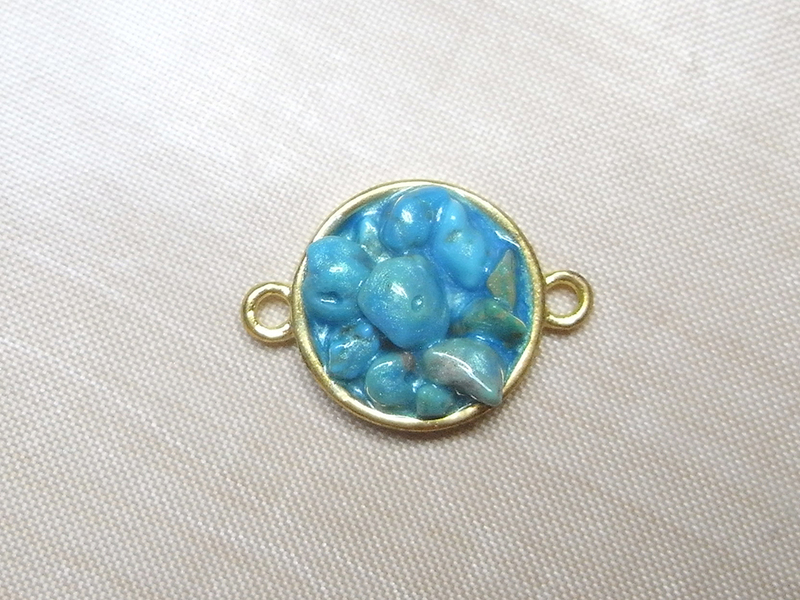 Connect them together by opening the eye pin loops and hooking them onto the bezel loops. 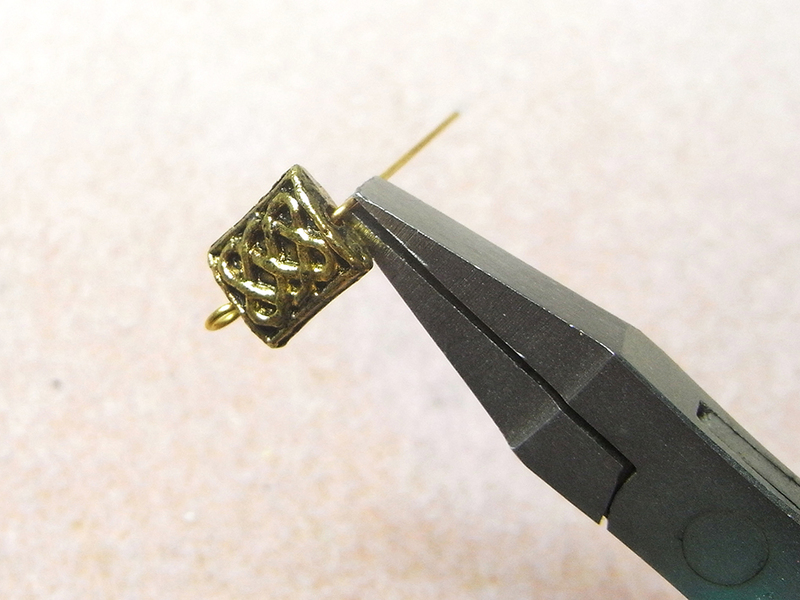 Use the split ring pliers to open a split ring and hook on one half of the clasp and the loop of one end of the bracelet. 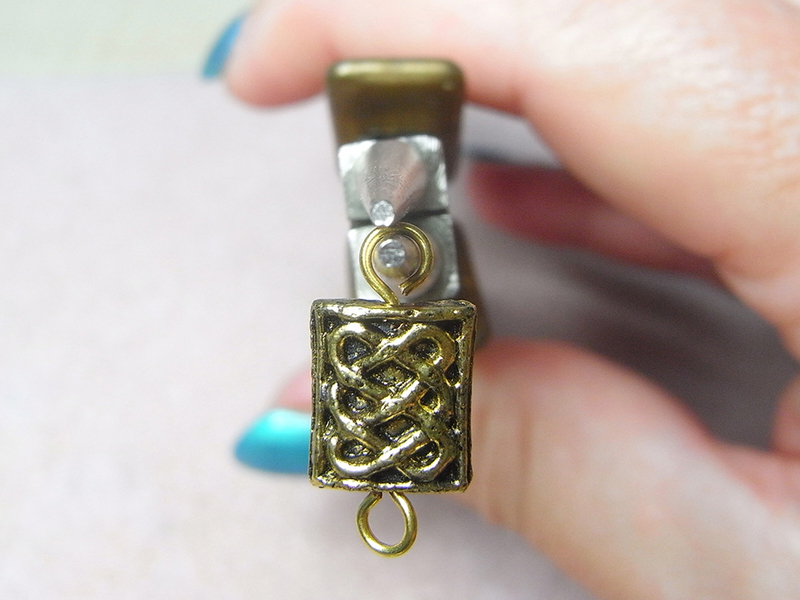 Attach the second half of the clasp to the other end of the bracelet with the other split ring. No assembly is required for the Nunn Design Patera Bracelet. Just remove the foam mounting tape and wear. 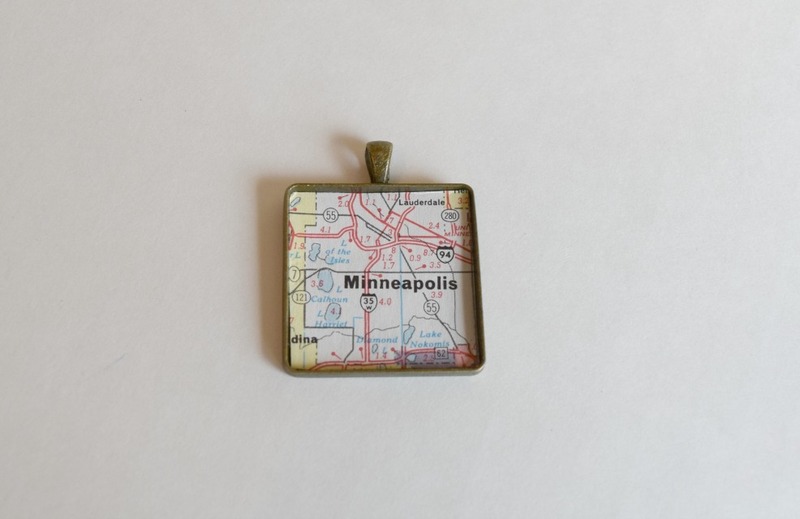 Today I would like to share with you how to make a necklace using a vintage map and EnviroTex Lite®. 2. 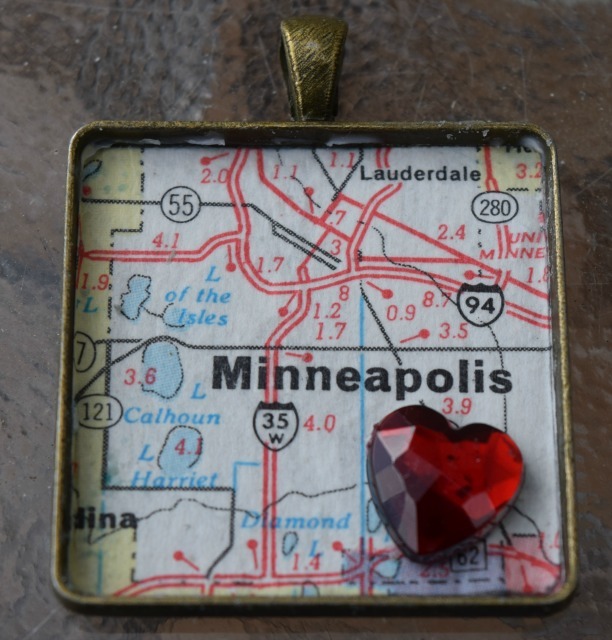 Take a bezel and lay it over the area to be used. Draw an outline of the bezel and cut out. 3. Trim until it fits nicely inside the bezel. 4. 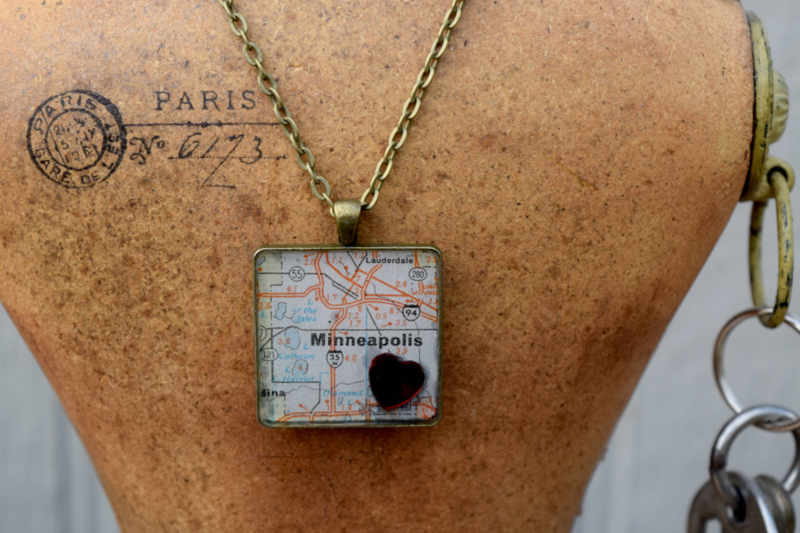 Apply Matte Medium or Mod Podge in the bezel and add the vintage map on top. 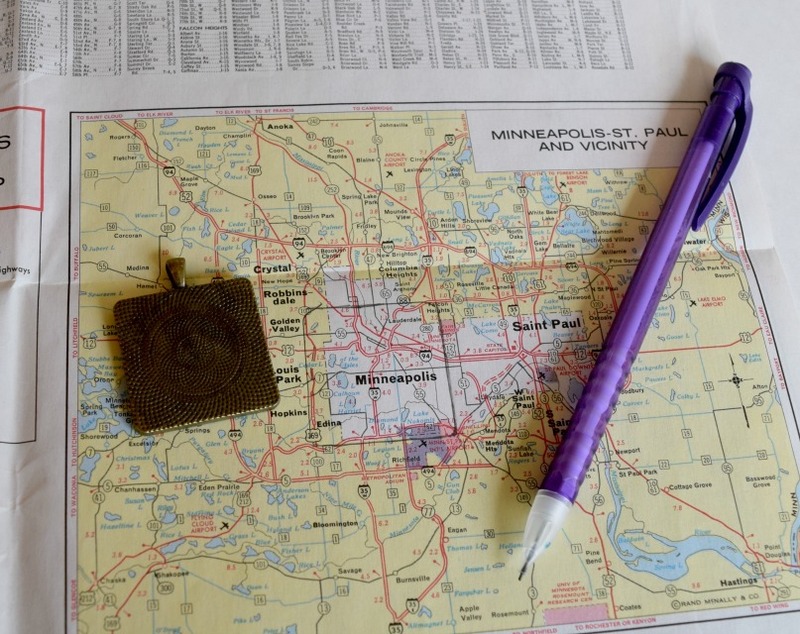 Press down and make sure map has no air bubbles. Apply more medium over the top to assure map is down completely with no air pockets. Adhere a heart gem. Set aside to dry. 5. 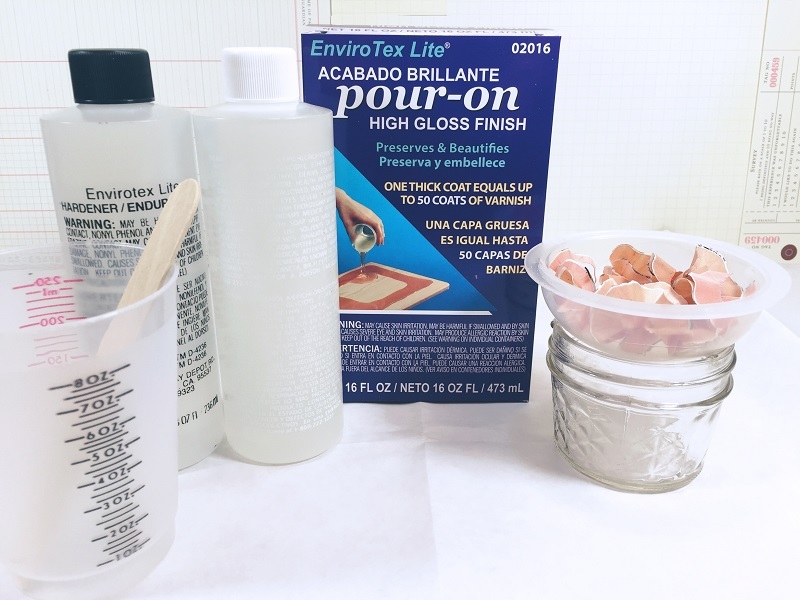 Pour EnviroTex Lite® Resin and hardener evenly into cups. Pour one into the other scraping sides. Stir for 2 minutes and pour into a new mixing cup, scraping the sides and stir for 1 additional minute. 6. Pour EnviroTex Lite® into the bezel. Using a lighter go over the top to take out any bubbles that may occur. Set aside till dry. Enjoy! I sure hope you give this a try! If you do, we would LOVE to see it!Thanks for stopping by the blog today! Before mixing FastCast™, cut 2 small pieces of cardboard, poke a hole into the center and place the screw for the knob through layering the cardboard. Test it on your mold for depth. Measure our equal parts of A and B. Stir for 30 seconds. Then, pour into a second mixing cup and stir for another 30 seconds. 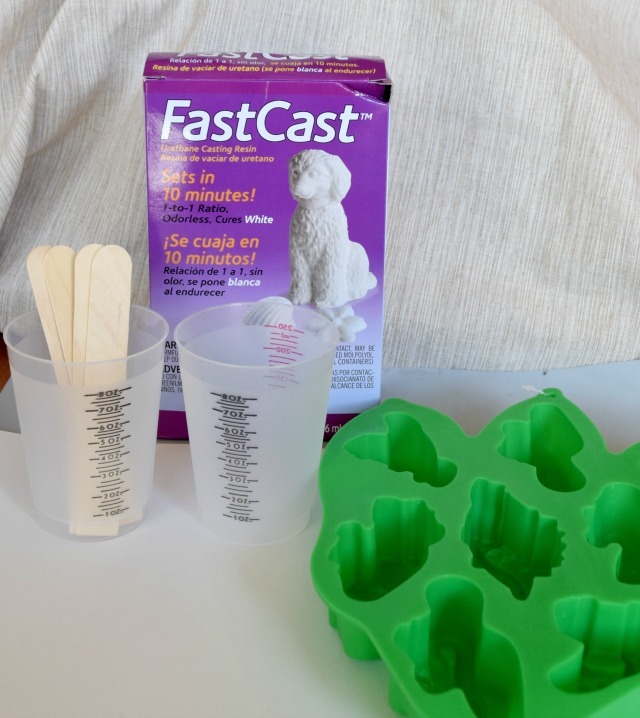 as FastCast™ sets in 10 minutes, so you want to pour as soon as you have it mixed. Place the prepared screw into the center of the mold, using something on either side to keep it at the correct height. 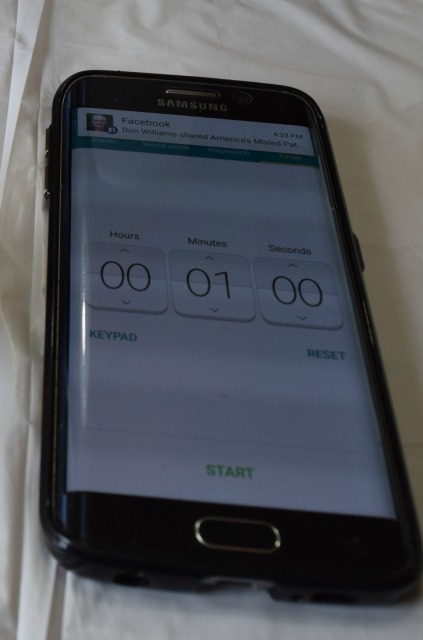 Let set for 10 minutes. Using the pliers to hold the screw in place, remove the knob. 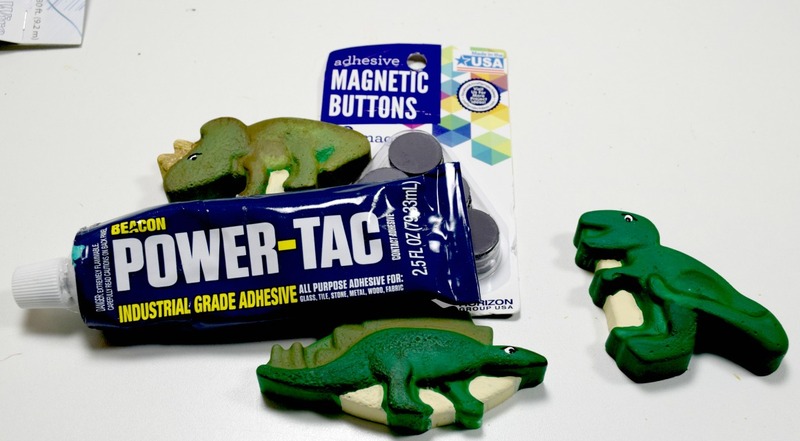 These are quick and easy to create with FastCast™. 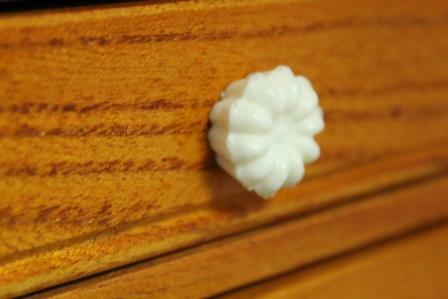 I left these white to show how quick and easy it is to create knobs, although FastCast™ can be painted if a color is desired. Last week we featured our newest product FastCast™, which is a two-component clear urethane casting resin, which turns white once set. FastCast™ sets to a hard cast in approximately 10 minutes at 70°F. 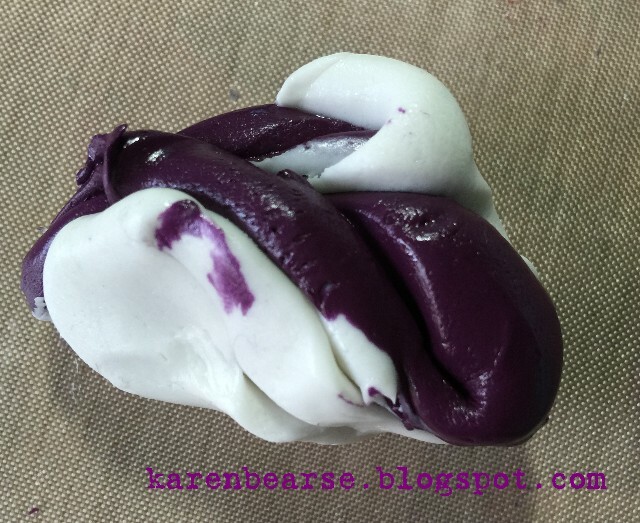 You can check out that post by clicking here.Today I am going to show how to create a mold for knobs using Silicone Putty. 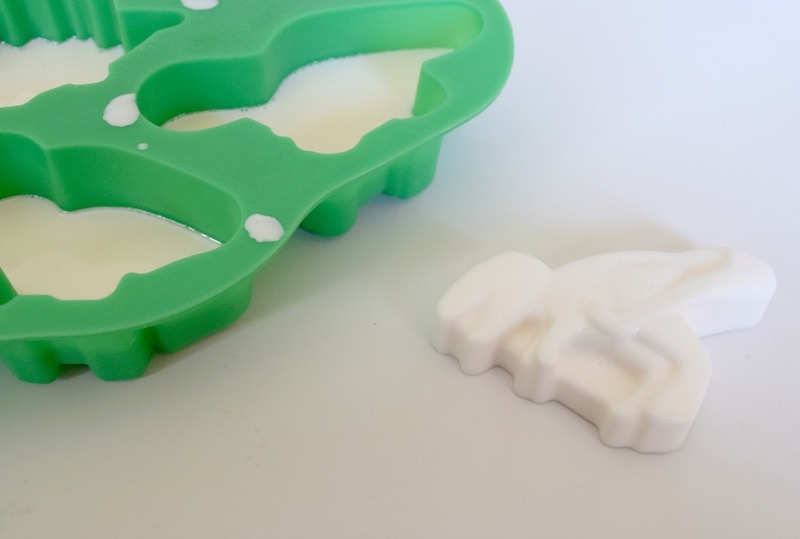 Be sure to check back on Thursday, as I will show you how to make some knobs using these molds and FastCast™. 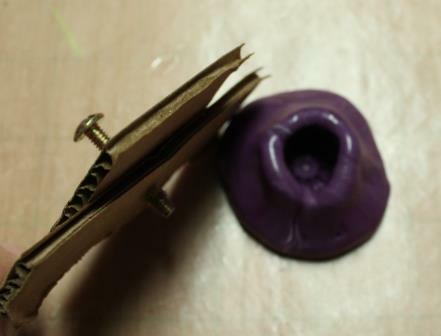 Remove the knob from the Silicone Putty. 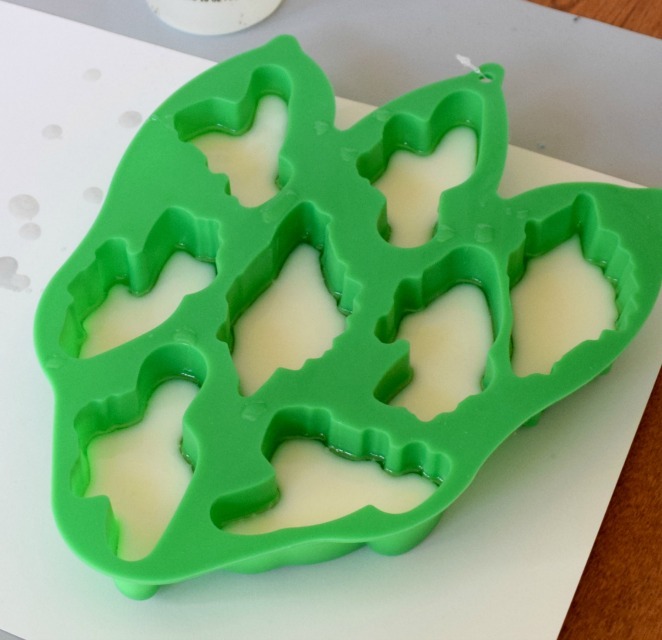 That is how easy it is to create a mold that you will be able to use over and over again. We are happy to announce that our newest product FastCast™, is now available! FastCast™ is a two-component clear urethane casting resin, which turns white once set. It is odorless and easy to use with a 1 to 1 ratio. It is ideal for casting, quick prototyping, miniatures, models, taxidermy and more. FastCast™ sets to a hard cast in approximately 10 minutes at 70°F. Once cured, FastCast™ can be drilled, sanded, shaped and painted. Stir together for 30 seconds.Pour into a second mixing cup and mix for another 30 seconds. This additional step insures a complete and thorough mix. Then, immediately pour into your mold. 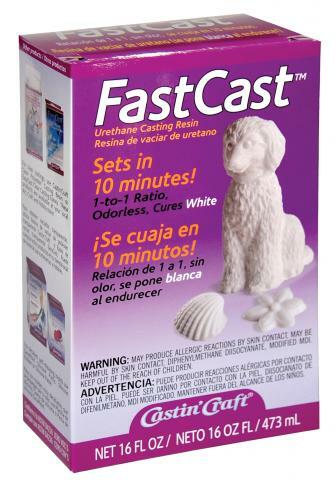 As FastCast™ begins cure , the mixed solution with heat up and begin to turn a dull white. Once cast (about 10 minutes) the piece will become bright white in color. Then simply demold and your piece is ready to be used.Check back next week as I will share how-to create some molds for drawer pulls and how-to cast them with FastCast™! 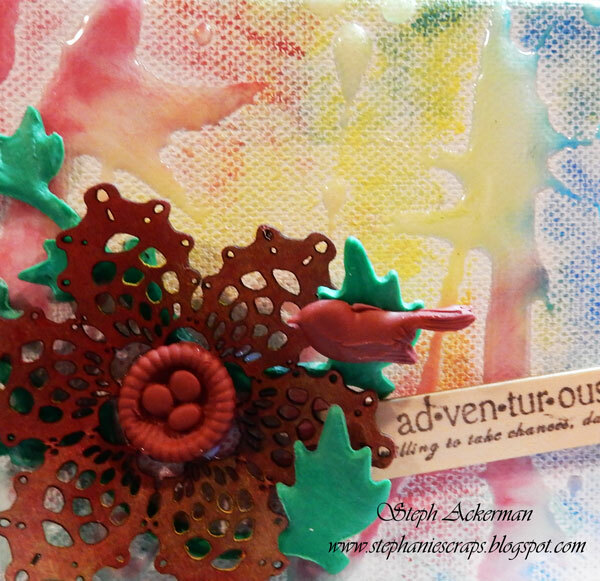 Today we are happy to have designer Steph Ackerman with an adventurous canvas to share. 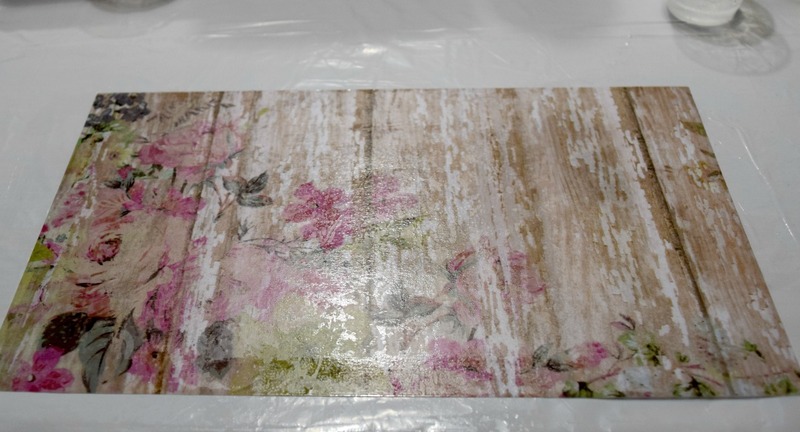 Have you ever thought of using EasyCast® Clear Casting Epoxy to create a background for your canvas? Well, that is just what I've done. To begin, mix equal parts EasyCast® Clear Casting Epoxy resin and hardener. Stir for 2 full minutes to properly mix the products. Then pour into a new container and stir for another minute. 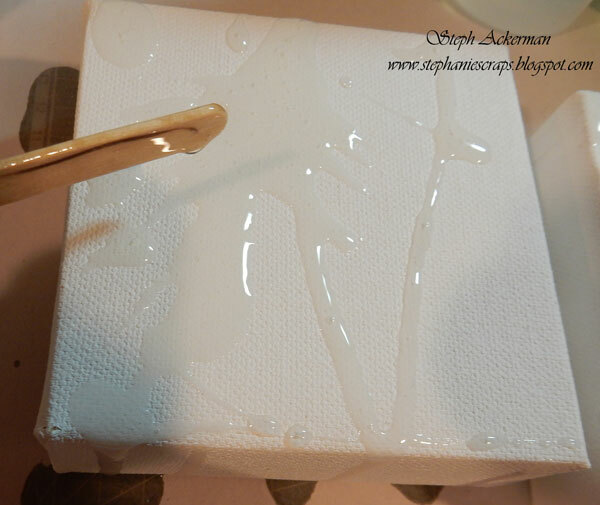 Then I poured the resin randomly over a 4"x4" canvas, using the stir stick to move the resin around. Allow to dry at least 12 hours before decorating. 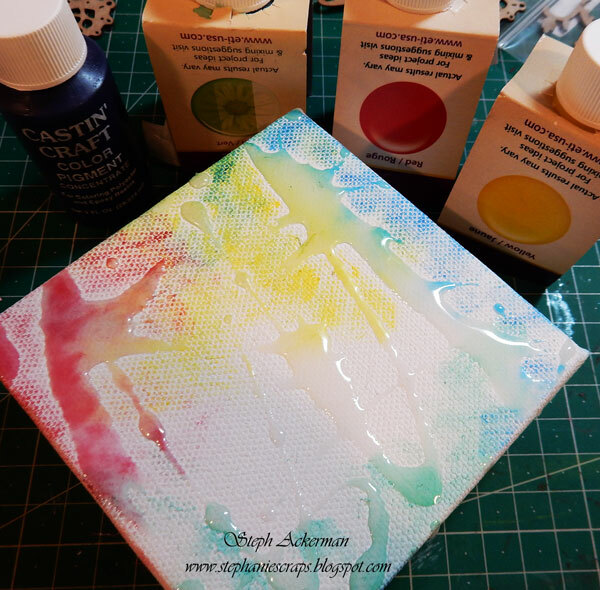 To add color I used a baby wipe to "paint "Castin Craft Opaque Pigments in red, yellow and blue across the canvas. I also used Castin Craft Transparent Dye in green for a little transparent effect. I love how the resin picked up the colors and show off it's 3 dimensional effect. 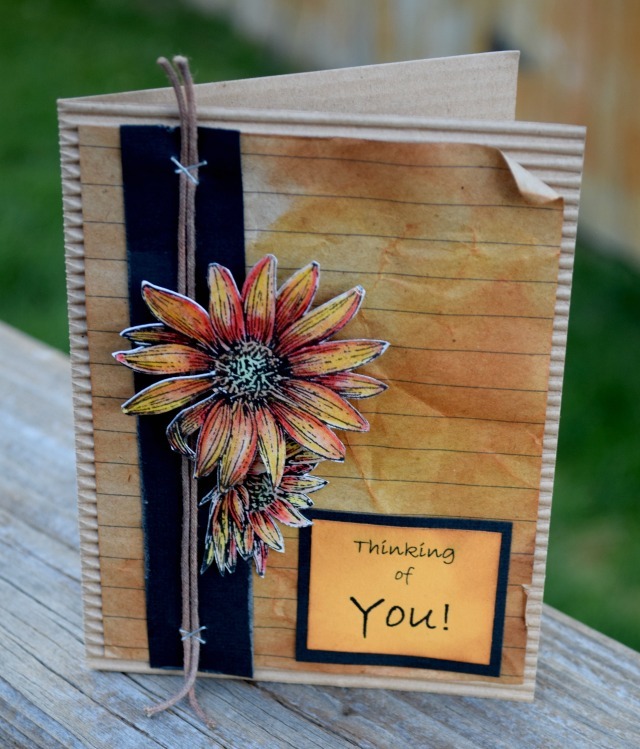 For embellishments, I used a chipboard flower that I also colored with Castin' Craft Opaque Pigments in yellow and red. 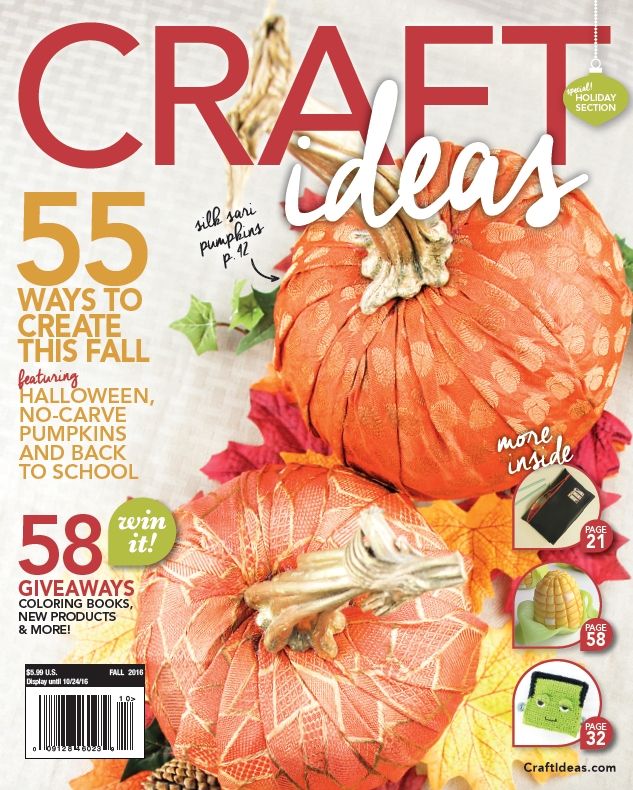 The bird, the nest and leaves were created with Makin's Clay, assorted molds and dies. Adventurous, was stamped onto a wood tag and all elements were adhered to the canvas with Beacon 3-in-1 Advanced Craft Glue. Have you ever even heard of a "Spoon Bowl"? 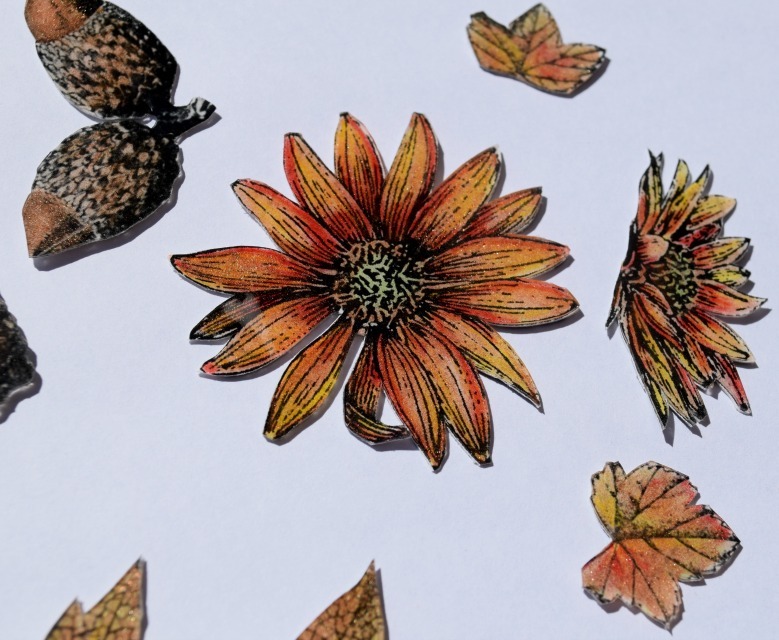 It is really rather cool...and today designer Myléne Hillam is going to share how to create one using EasySculpt® Epoxy Modeling Clay! Dust the bowl liberally with Talcum Powder. This will act as a release agent. Before beginning, put on your gloves – EasySculpt will be sticky whilst you are working with it. 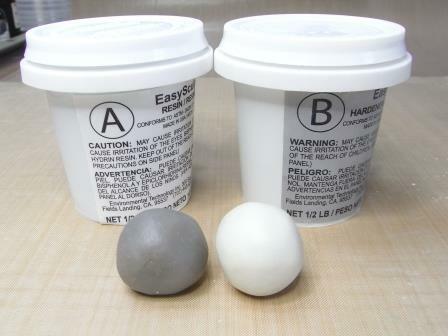 Measure out equal quantities of EasySculpt Parts A and B, the size of large marbles. 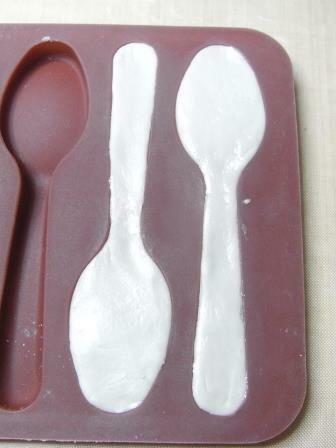 Place the EasySculpt into a spoon cavity and push it out to the edges. 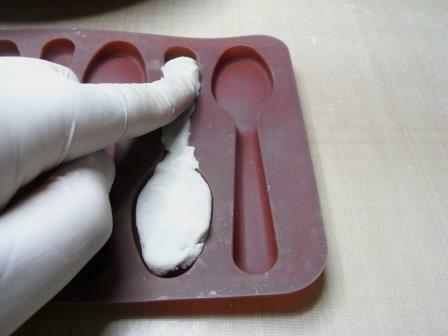 Press it firmly into the bottom of the mold so that you have formed complete spoons. 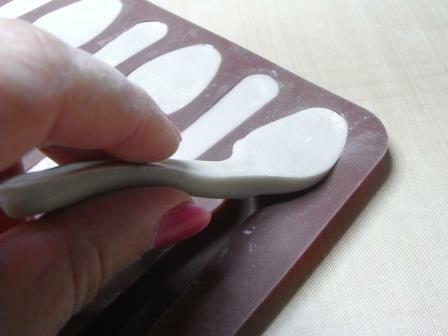 To neaten the edges of the spoon, use you finger to roll the edge back into the clay. Mix more EasySculpt to fill all twelve spoons. Lightly dust the surface of each spoon and then demold the first spoon. Position the spoon at the 12 o’clock position in the bowl with the handle in the center of the bowl. Demold three more spoons and place them at 3, 6 and 9 o’clock. 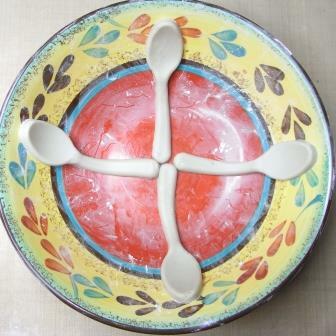 Demold the remaining spoons and position them evenly between the first four spoons leaving an open circle in the middle of the bowl. Adjust them so that the handles abut. 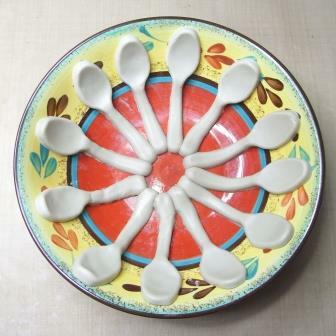 Continue to adjust the handles of the spoons until the clay firms up. Set the bowl aside for 24 hours to cure. 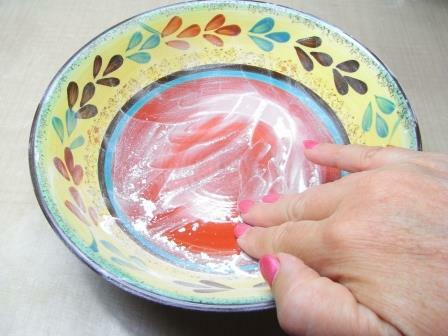 Carefully remove the spoon bowl from the dish, releasing one spoon at a time. Use the knife to trim away any rough edges. 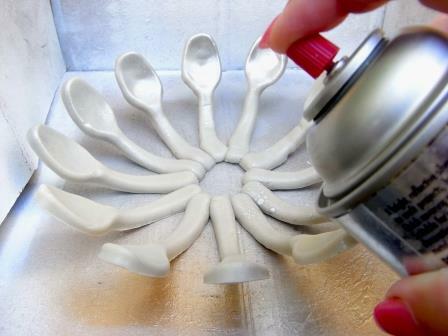 Spray the inside and the outside of the bowl with silver spray paint and allow it to dry. 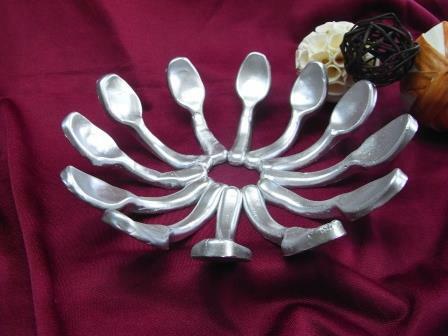 Display your beautiful Spoon Bowl and enjoy!! 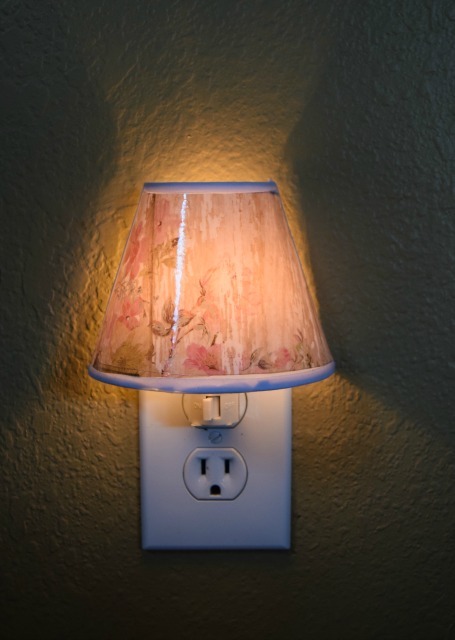 Today I am going to share with you how to make resin paper usingEnviroTex Lite® so that you can make your own night light! Cover area with a plastic garbage bag. Tape down to make as flat as possible. Pour resin into hardener and stir for 2 minutes. Now pour it back into a clean measuring cup making sure to scrape sides and stir for 1 more minute. Apply a coat of EnviroTex Lite® onto the front of paper using the sponge. 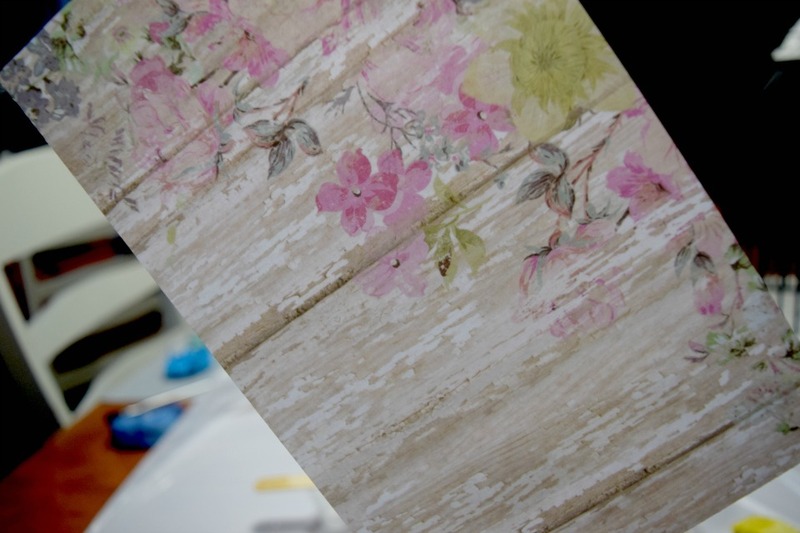 Flip the paper over and apply a coat of the resin onto the back side. Flip paper back to front and smooth out any rough areas. Make sure it is completely covered. Let dry 12-24 hours depending on your surroundings. It is very dry here in Colorado. You can see here it is somewhat transparent. 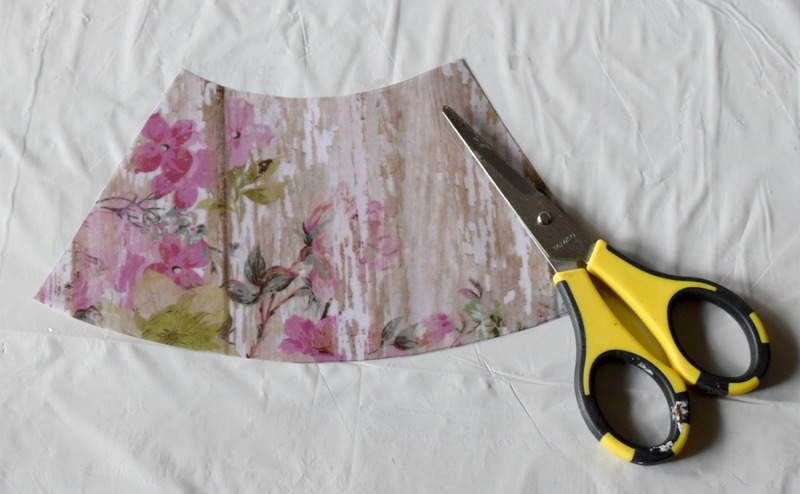 Pull the template off of night light and cut out. Look how pretty it looks all lighted up! One winner will be picked, at random, Sunday, July 31, 2016, at 10pm CST. The winner will get both Petite sets of Gel Press plates and ETI Jewelry Resin! Hop now through Sunday! Winner must be 18 or over and live in the USA. Good Luck! 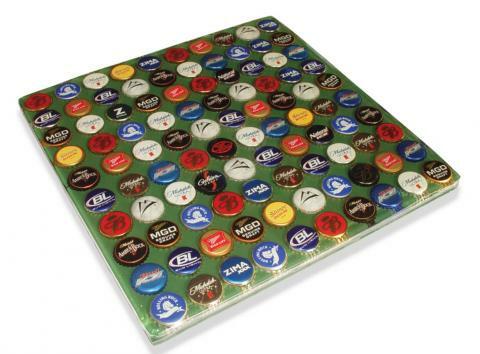 Today we have a multi-layered bottle cap table top project from Hillary Stephens using EnviroTex Lite® pour on coating. Bottle caps, must be clean and dry; plan on 100 caps per square foot. 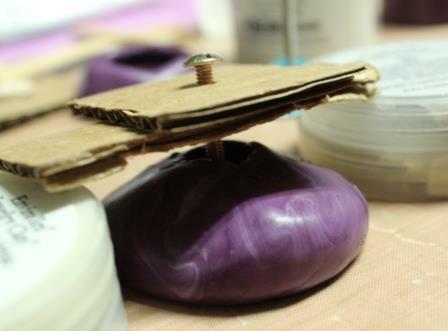 If project base is made of wood, seal wood with a thin layer of white glue or paint the surface and let dry. The thin layer will seal the air pockets of the wood and prevent air from releasing bubbles in the thick layers of the EnviroTex Lite®. If you choose to use the EnviroTex Lite® as the thin sealing layer, apply with a sponge brush. Don't use the propane torch on this thin layer of the EnviroTex Lite®. DO use the propane torch on subsequent layers. Projects with a permanent rim that contains the coating are most easy. Temporary borders may be created by affixing painters masking tape to sides of project, allowing tape to stick up and create a dam. 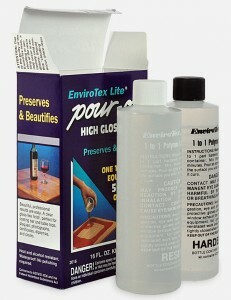 Pour a layer of the EnviroTex Lite®. Remove the tape 8‐10 hours later and apply new tape for each layer. The tape will NOT result in a straight, smooth edge. For the final layer, we recommend sanding the sharp edge with sandpaper and pouring the EnviroTex Lite® on the top and allowing coating to flow over the side of the project; this layer will conceal all sanding marks and will make the sides of the project clear and smooth. Drips may be sanded from the underside later. Slats of wood coated with two layers of paste wax can also be used for temporary border; seams of the wood slats must be taped to prevent coating from flowing and dripping through seams. Glue the bottle caps in place with white glue; fill ruffled area of bottle cap with glue to prevent air from escaping from underneath. Allow glue to dry overnight. Caps must be glued in place because cap can lift and float. Apply the first of several layers of the EnviroTex Lite®; use 6 ounces of pour on coating for every 12 square inches. 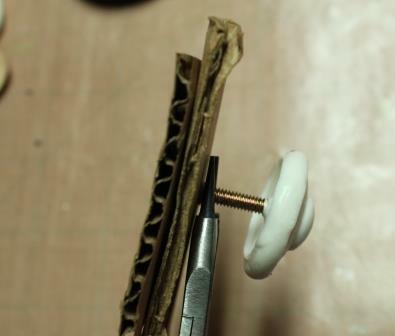 Most bottle cap projects will require 3‐5 layers of 6 ounce volume; allow 8 hours curing time between layers. Bubbles will form around the sides of the cap, swish a brush around the cap to encourage the bubbles to release and rise. Coating may be sanded between layers but it's not necessary. 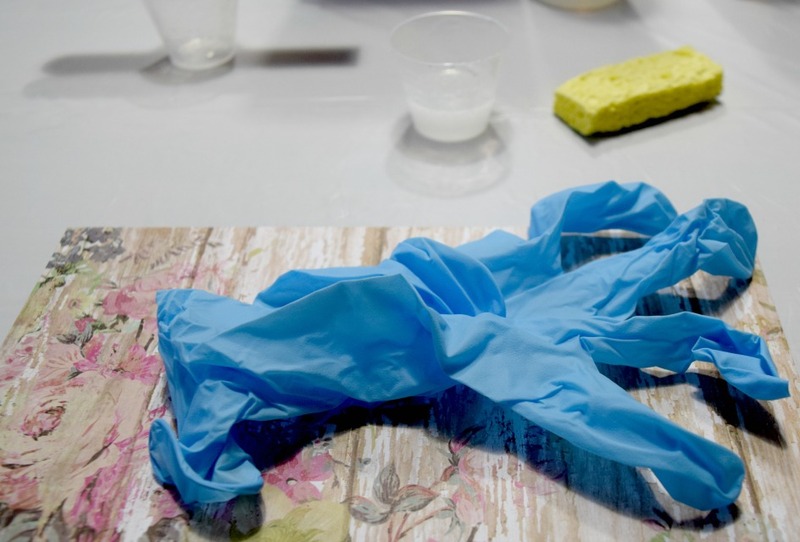 If surface is sanded, wipe with alcohol or acetone and a clean rag to remove dust particles. If surface is sanded it must be re‐coated. minute period following application. Important: read all instructions included in kit. 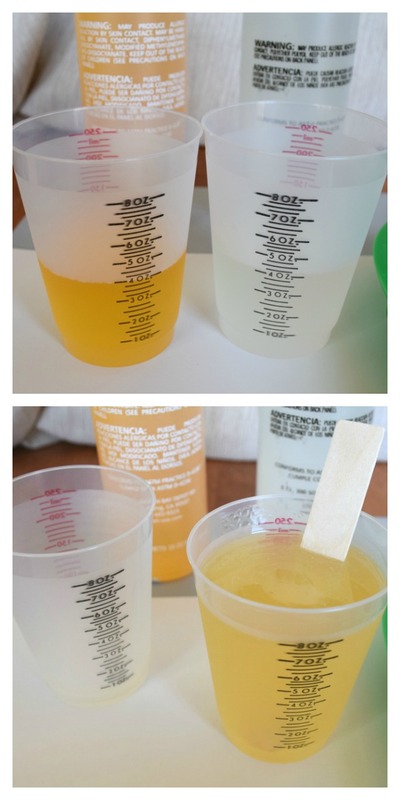 Blend with a wood paint stick for two minutes, mixing vigorously while scraping sides and bottom of the mixing cup. Then pour coating into a new, clean mixing cup and blend for another minute. Thorough blending is achieved by the above mixing method only! Discard mixing stick. Pour coating onto project immediately. Use the propane torch to remove bubbles from the coating. You may need to use the propane torch several times during a forty-five minute period, following the application. Important: read all instructions included in the kit. NOTE: If project base is made of wood, stain and then seal wood with a thin layer of white glue or paint the surface and let dry. The thin layer will seal the air pockets of the wood and prevent air from releasing bubbles in the thick layers of EnviroTex Lite®. If you choose to use EnviroTex Lite® as the thin sealing layer, apply with a sponge brush. Don't use the propane torch on this thin layer of EnviroTex Lite®. DO use the propane torch on subsequent layers to remove bubbles. 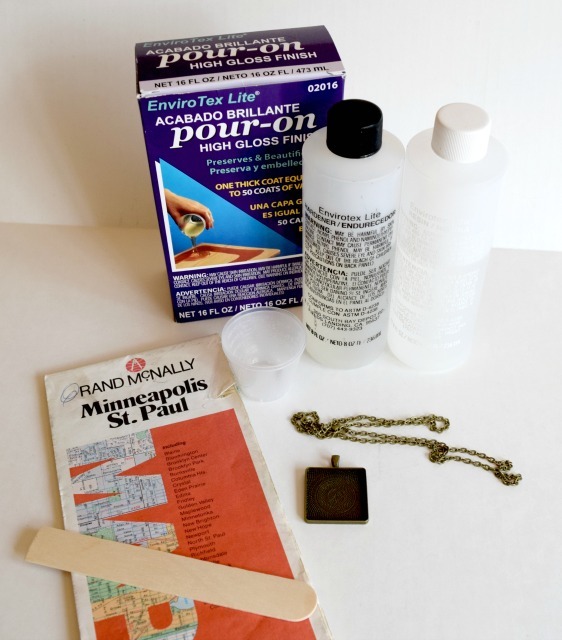 Mount paper or fabric patches to surface of table using white glue that dries clear. Paper must be smoothed onto surface and all air bubbles pressed from beneath the paper. Allow glue to dry. 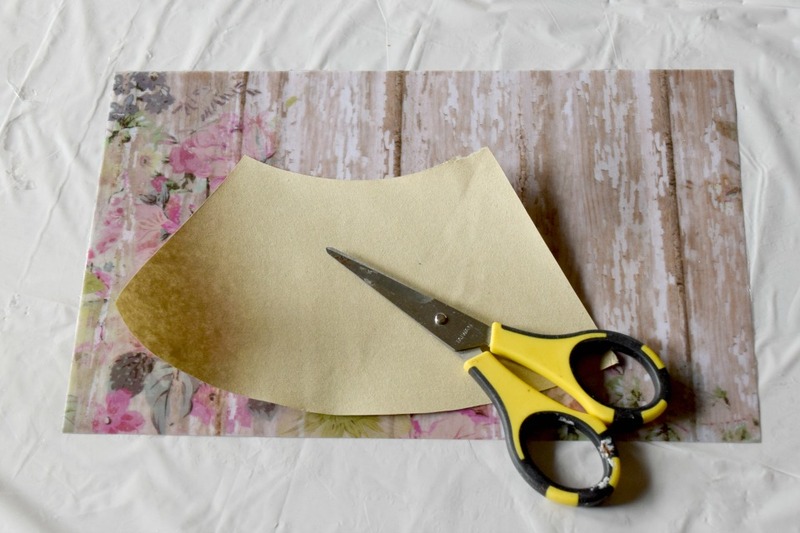 Apply TWO layers of white glue over the top of paper or fabric, allowing each layer to dry thoroughly. Apply glue with sponge brush. The glue creates a protective layer to prevent EnviroTex Lite® from being absorbed and darkening paper. Allow final layer of glue to dry over night. IPS on BLENDING COATING: Always measure equal parts of resin and hardener. Blend with a wood paint stick for two minutes, mixing vigorously while scraping sides and bottom of bucket. Then pour coating into a new, clean mixing cup and blend for another minute. Thorough blending is achieved by the above mixing method only! Discard mixing stick. Pour coating onto project immediately. Use propane torch to remove bubbles from coating. You may need to use propane torch several times during a forty-five minute period following application. Important: read all instructions included in kit.